In the quest for the identification of Beethoven's mysterious Immortal Beloved, which, since the composer's death, has kept a lot of researches busy, a number of candidates has emerged of which Josephine Baroness von Stackelberg, née Countess von Brunsvik, widowed Countess von Deym, in recent years was able to secure a leading position. Since I have never entered the hotly contested field of "Immortal Beloved Research", I have been able to observe the dispute concerning the identity of this mysterious woman with wonder and amusement. The significance of this woman's identity, in my opinion, tends to be vastly overrated and the scholarly discourse has only too often been driven by personal antipathies and the urge to settle old scores. From my point of view, the advocates of the most popular identification models have continuously been damaging their own agenda by presenting circumstantial evidence as *facts*, and mere hypotheses as *solutions*. This blog post is not an article about the identity of the Immortal Beloved. An unexpected find of a document in the Municipal and Provincial Archives of Vienna in August 2017, suddenly pointed my attention to the previously unknown location of Baroness von Stackelberg's grave and the posthumous fate of her mortal remains. Considering the stunning misinformation that can be found in the Beethoven literature in general – as well as in the latest publications dealing only with the Immortal Beloved – this side issue has suddenly moved from the fringe of IB research to the center of attention. v. Stackelberg Wohlgebohrener Herr Christoph Freÿ- / herr von ––––, seine Frau Gemahlin Josep- / pha, gebohrne Gräfin Brunswik, von Ofen [sic] / gebürtig, im eigenen H: N. 648. in d. Adl / Adlergas. an d. Auszehrung, alt 40. Jr. / Nachmittag 5 1/2. Uhr. Kerndl. The Countess's wrong place of birth is not the only inaccuracy in the above entry. Since Joseph von Deym in his will had decreed that – in the case of her marrying again – his widow should waive the ownership of her half of the building to her two sons Friedrich and Karl, at the time of Josephine's death in 1821, the Müllersches Gebäude was owned by her four children: each of the sons owned 3/8, each of the daughters held 1/8 of the building. When in 1810 Josephine von Deym married Baron von Stackelberg, all she was entitled to keep from her first husband's inheritance was her dowry of 20,000 gulden and her share of the movables in Prague which in 1804 had been estimated at 6,027 fl 47 1/3 kr (A-Wsa, Grundbuch B1/26, fol. 46r). As of 1810, the Countess did not draw any independent rental income and was dependent on her children's assets and the cooperation of her children's guardian Franz Count von Sauer. This information concerning Josephine von Deym's financial situation during the time of her second marriage has heretofore not been addressed in the literature. When Josephine in 1813 wrote in a draft of a letter to her husband: "Wenn du das Haus, die Gallerie, mein Vermögen wieder herstellst aufrichtest, so darf dich das nicht hochmüthig machen, weil du nur ein Gebrechen verminderst [...]" (Goldschmidt, 1977, 164), this statement was based on the false premise that Josephine still owned the Müllersches Gebäude. When John Klapproth writes: "Mother Anna declared that she would withdraw any further support unless Josephine sold the Deym villa", he is unaware of the fact that at that time Josephine did not own any part of this "Deym villa". "Am 31. März 1821 abends um 5 Uhr starb Josephine – endete ihr irdisches grosses Leben um ein grösseres zu beginen." So schrieb Therese in ihr Tagebuch. Josephine wurde auf dem Währinger Friedhof zur letzten Ruhe gebracht. Kein Gedenkstein bezeichnet ihr Grab, keine Inschrift sollte der Nachwelt auch nur schlichte und knappe Kunde von ihrer Existenz überliefern! Auch hier hat die Familie Brunswick ihre damnatio memoriae in aller Strenge bestätigt. Almost exactly six years before Beethoven, Josephine von Brunsvik had been quietly interred at the Währing cemetery" (Klapproth 2011, 6). Josephine Countess von Brunsvik, who was buried without ceremony, without obituary, even without any mourners. No tombstone on her grave. (Klapproth 2011, 6). Josephine von Brunsvik died on 31 March 1821 in her own home, only accompanied by Viky, her oldest daughter. She was buried without any ceremony at Währing cemetery. No memorial stone marks her grave ... Once again the Brunsvik family has applied the damnatio memoriae with full severity. Exactly six years later, Breuning and Schindler would choose there "where he always liked to stay", a burial place for Beethoven. Josephine Stackelberg geborene Brunsvik verwitwete Deym fand am Währinger Friedhof ihre letzte Ruhe, wobei ihr von ihrer Familie wegen ihres "lasterhaften Lebens" sowohl eine Begräbniszeremonie als auch ein Grabstein verweigert wurden. Sechs Jahre später wurde das Musikgenie, nur wenige Meter von der Geliebten entfernt, beerdigt. 20000 Menschen kamen, um von ihm Abschied zu nehmen. The foundation for this kind of gross misinformation was laid by Tellenbach who fell victim to an autosuggestion and failed to gather additional information concerning Catholic burial rites in Biedermeier Vienna. 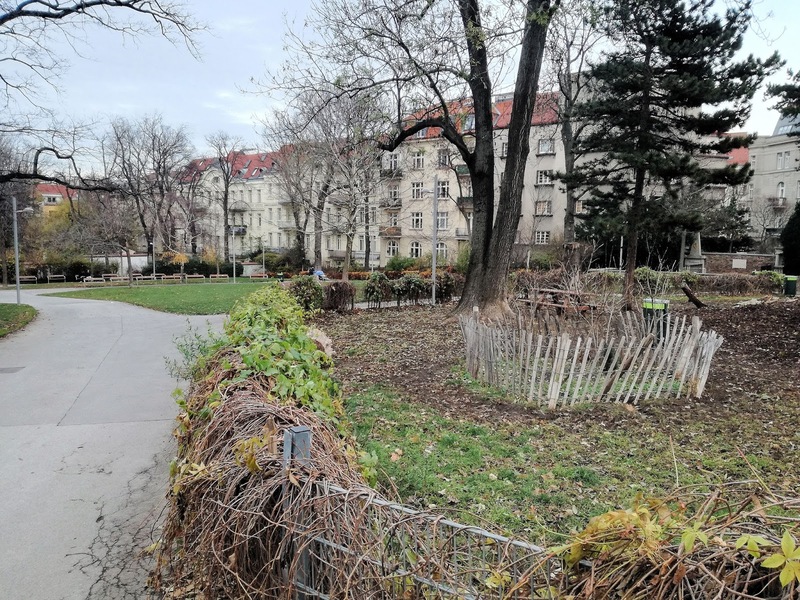 In addition to that, Tellenbach did not know that until 1923 there were two cemeteries in Währing (which in 1821 was located in Lower Austria): 1) the Allgemeiner Währinger Friedhof (today's Währingerpark), outside the Nussdorfer Linie , and 2) the smaller Währinger Ortsfriedhof (today's Schubertpark) which was located south of the Währinger Straße, about 400 meters west of the Währing parish church. There are three main reasons as to why the narrative of Josephine's remains "having been quietly interred [verscharrt] in Währing" is completely untenable. 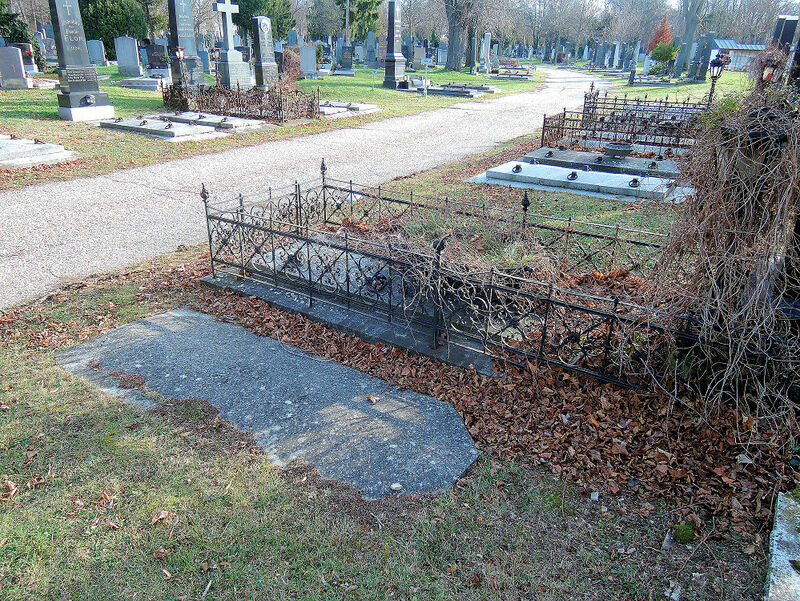 The alleged lack of a memorial stone or any other kind of marker at the grave has no basis in any document related to Josephine von Stackelberg's burial. Because the Ortsfriedhof in Währing was so small, prior to 1841, unmarked anonymous graves were not allowed there. To have an adult buried in this cemetery, one needed to buy an own grave and order a 1st or 2nd-class burial. These requirements gave this cemetery a reputation of slight elitism. 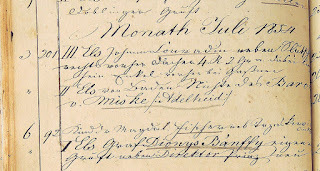 The Brunsvik family – who according to Tellenbach put a damnatio memoriae on a family member – had no say in the proceedings related to Josephine's burial. The decisions lay with her children and their guardian Franz von Sauer. Therese von Brunsvik was in no position to put a possible grudge into practice. The religious regulations made it impossible to deny a Catholic person (a Baroness to boot) an official burial ceremony. Such ceremonies were not even denied in cases of suicide, because members of the upper class always were able to secure a medical certificate that declared the deceased "mentally incompetent" at the time of death. The sources related to the events right after Baroness Stackelberg's death clearly document the course of events. On Saturday, March 31st, 1821, Josephine von Stackelberg received the last rites and died at 5.30 p.m. The following Sunday delayed the organisation of the solemn obsequies which could take place but in the morning of Tuesday, 3 April 1821, at the Church of St. Maria Rotunda in whose parish the Müllersches Gebäude was located. At that time the parish priest Hyazinth Christen was not yet informed of Währing being the chosen burial place and wrote "S. Marx" into the register (a similar error happened in 1828, on the occasion of Franz Schubert's obsequies at St. Josef zu Margareten whose records give the Matzleinsdorf cemetery as the composer's intended burial place). Josephine received a "II. Classe, 1. Rubrik" burial and the appropriate obsequies which, in the case of a lady of noble birth, were an indispensable act of public observance of piety in accordance with the social reputation of the deceased. A modest or inconspicuous burial would have gravely damaged the family's credit in the eyes of the public. 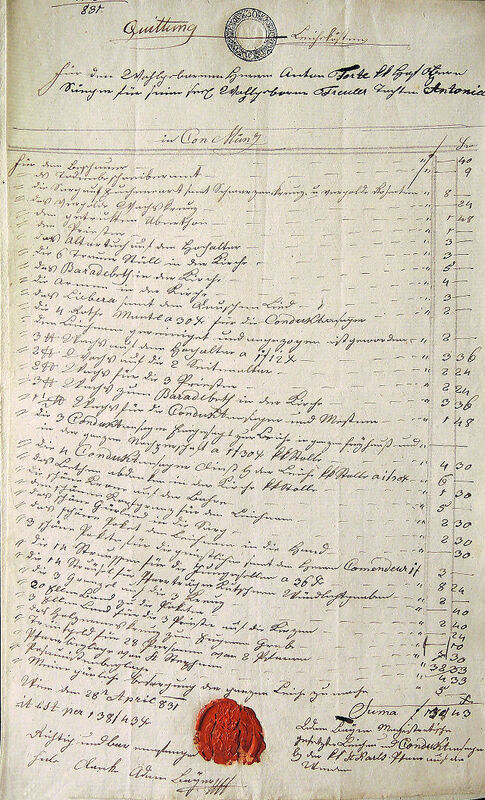 The exemplary list of expenses for the obsequies and the cortege of Antonia Forti on 20 March 1831, written by Adam Bayer, municipal master of burial ceremonies and funeral corteges at the Karlskirche (A-Wsa, Patrimonialherrschaften, A103, 348). In 1923, together with her father's, Antonia Forti's remains were transferred from the grave No. 301 in Matzleinsdorf to the "Gräberhain". For a more expensive funeral at the Karlskirche see that of Heinrich Weiße, professor of political science at the Theresianum, which took place on 14 March 1834 and cost 243 gulden 2 kreuzer (A-Wsa, Patrimonialherrschaften, A103, 389). The charitable payments to poor people, who regurlarly took part in obsequies and the following corteges to graveyards, were an essential part of the welfare system in Biedermeier Vienna. Some of the items given in the above list, such as the crown and the 14 bachelors, were applied because the deceased was an unmarried minor. Like in the days before the Josephinian reforms in 1781, there was a great selection of possible costly improvements to the ceremony: the use of a castrum doloris needed additional 13,5 lbs. of wax (at a cost 6 f 12 x) and the service of seven additional "Conductansager" which – according to the "KK Stolle" (the scale of charges) – cost 1 f 30 x each. The performance of a Requiem involved the payment of a "Regenschoribeylage" of up to 40 gulden. 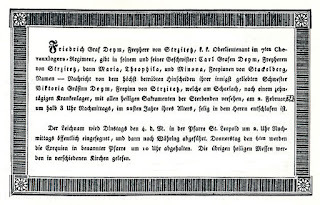 The Deym family certainly commissioned the printing of "Partezettel" (death notices) of which 100 copies cost 2 f 24 x. There are countless examples in probate files of people who were concescrated at the Dominican Church that show how high the costs of burial expenses could be. On 15 February 1821 the obsequies of the former merchant Jakob Calliano took place at this church. His obsequies at St. Maria Rotunda cost 547 gulden 40 kreuzer. He then was transferred to Mödling, where he owned a house, to be buried in the local cemetery – a ceremony which cost an additional 233 gulden and 28 kreuzer (A-Wsa, Mag. ZG, A2, 69/1821). 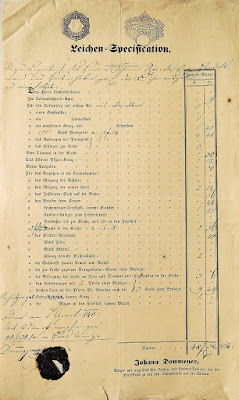 Some Viennese parishes, such as the parish "Zu den heiligen Schutzengeln" on the Wieden, handed out printed standardized receipts for funeral expenses titled "Leichen=Specification". These forms also document the obligatory fees that were only waived in case of certified poverty. The entry in the Bahrleihbuch (the register of burial fees of the Bahrleihamt) shows that, after the solemn obsequies at the Dominican Church, Baroness von Stackelberg's coffin was transported to Währing in a carriage drawn by four horses (the wrong cemetery "St. Marx" was copied from the false entry in the parish register). Wagen mit 4 Pferd Nach Wahring 12 f – kr. Christoph Baron von Stackelberg's wife Josepha née Countess von Brunswik, 40 years of age, died on the 31st in the evening at 6 p.m. and was inspected to have died of consumption. 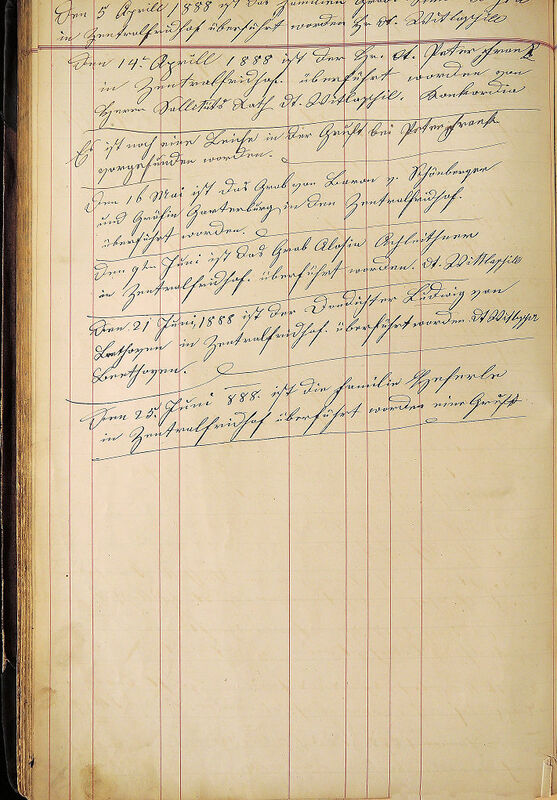 As far as the costs of the ceremony and the burial in Währing are concerned, we can rely on documents from Beethoven's probate file (A-Wsa, Hauptarchiv, Persönlichkeiten B16, fol. 92). Like Beethoven, Baroness Stackelberg was buried according to the 2nd class (between 1821 and 1827 the regulated standard prices did not change). Uiber Fünfzig Gulden CMz. welche für die nach der II. Klaße gehaltenen Leiche des verstorbenen H[errn] Ludwig von Bethoven als sämtliche Auslagen an die Kirche, Pfarre, Armeninstitut, für Totengräber, Träger, Ansager, und Vorbether, Meßner, Ministranten, Ausläuter, für mitgehende Instituts-Arme und Schulkinder sammt Aufsicht tragenden Schulgehülfen, für das Miserere, und Motteten, für Libera und Assistenz &c sind gezahlt worden. For fifty gulden Conventionsmünze [assimilated coinage] which were paid for the 2nd class burial of the deceased Mr. van Beethoven as overall expenses to the church, parish, almshouse, for the gravedigger, bearer, director of the ceremony and litanist, sexton, altar boys, bell ringers, for the accompanying poor from the almshouse and school children, together with the supervising school assistants, for the Miserere, the motets, the libera and the assistance, etc. 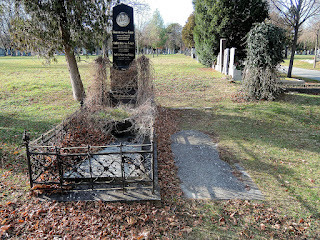 The costs of Baroness Stackelberg's own grave in Währing are also well documented. A grave in Währing cost 30 gulden which was more expensive than a grave in the so-called "Kommunalfriedhöfe" which in 1819 cost 20 fl 42 x. Beethoven's probate file (A-Wsa, Hauptarchiv, Persönlichkeiten B16, fol. 99) contains the following receipt. Über Dreyssig Gulden CMz welche für einen einfachen Platz auf dem hiesigen Pfarrfreydhofe zur Ruhestätte des verstorbenen Herrn Ludwig von Beethoven an die Pfarrkirche zu Währing sind gezahlt worden. Währing den 27ten März 1827. For thirty gulden Conventionsmünze [assimilated coinage] which were paid to the parish church in Währing for a simple spot as resting place of the deceased Mr. Ludwig van Beethoven. In Währing Baroness von Stackelberg's coffin was taken from the carriage, put in front of the altar of the parish church and consecrated again. 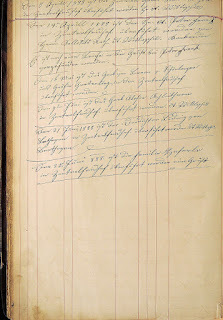 The entry in the Währing burial register concerning this ceremony repeats the information from the parish of St. Maria Rotunda: "Dem Wohledlgeborenen H. Christoph Freÿherr v Stakelberg seine Frau Gemahlin Josepha Gräfinn Brunswik". 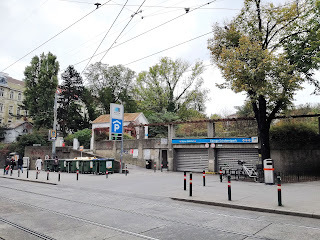 The cortege then continued its way to the Ortsfriedhof where Josephine von Stackelberg was buried in an own grave "in the fourth row" – which, so far, is the only information we have as to the gravesite's exact location (see below). One thing is certain: Josephine von Stackelberg's burial site was not located "in close proximity" to what in 1827 was to be Beethoven's. Josephine's eldest child Victoire (born 6 May 1800) died of scarlet fever on 2 February 1823, at 2:30 p.m., in the house Leopoldstadt 9 (the so-called Altes Dianabad which had been built by Charles de Moreau). One after the other, Josephine took four of her gentle daughters in the prime of life and in the most beautiful hopes for their earthly future. Victoire, the shining star, was the first at the age of 23 years; she was declared of legal age and was supposed to help educate her orphaned brothers. Together with me she would have established and directed a great educational institution in the beloved fatherland! Weißkirchen near Tyrnau was chosen as its location. We wanted to call it Antonaeum, in honor of my precious father! In 1823, on February 2nd, after a short illness of five days, – scarlet fever that had affected the brain – after she had escorted her mother and her aunt to the grave, and in sickness and death had taken care of them like an angel, she died, and, as the legend has it, was seen again after her first death inside the crypt of St. Stephen's! 1) . How this story could ever gain credibility is completely inexplicable. First, all the primary sources show that Victoire von Deym was not buried immediately, but – in accordance with the law of that time – two days after her death. Second, she was not buried in the crypt of St. Stephen's. After the reforms of Joseph II, burials in the crypt of the Cathedral were limited to members of the high clergy (such as, for example, Bishop Hieronymus von Colloredo in 1812). Third, Victoire was buried in her mother's grave in Währing which renders the whole tale of her trying to open a "front door" of a crypt fictitious. That the tale of Victoire von Deym's "Scheintod" was ever taken serious is even stranger, given the fact that her death notice clearly gives her obsequies as having taken place two days after her death, on 4 February 1823. This death notice gives the church of St. Leopold as venue of her consecration, but this is an error. Since the Dianabad was located in the parish of the Carmelite church of St. Joseph, Victoire's obsequies were held in this church. 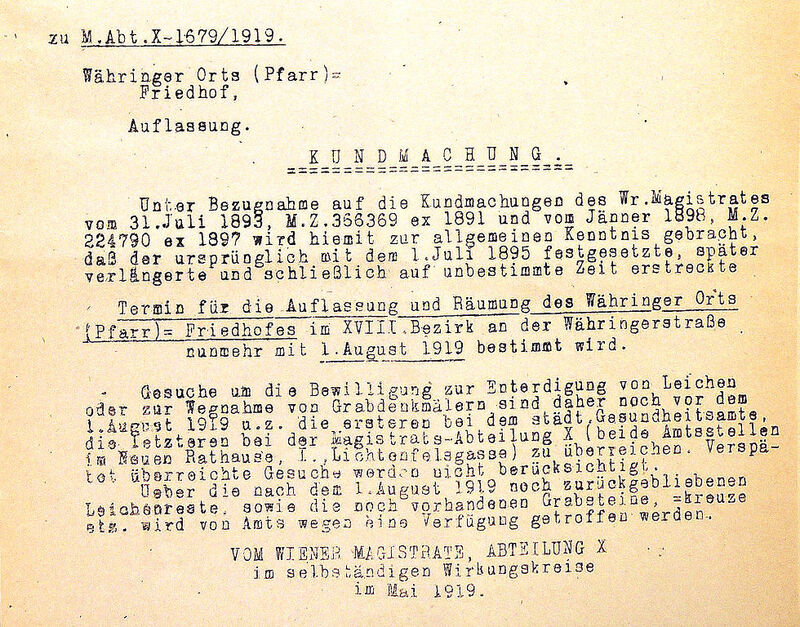 This document also states that "the body will be consecrated at 2 p.m. and then transported to Währing". Victoire von Deym's cortege proceeded similar to he mother's two years earlier. Her brother Fritz and her aunt Therese may have been the only relatives that accompanied the coffin. Her brother Karl was with his grandmother in Ofen and her three half-sisters, Marie, Theophile and Minona, were staying with their father in Estonia. Josephine von Deym's son Friedrich (a godson of Count Friedrich von Nostitz-Rieneck and Franziska Duchess of Württemberg) was one of the more prominent members of the Deym family. After a career in the Austrian military and as official at the Viennese court, in 1848 he became a member of the Frankfurt Parliament. 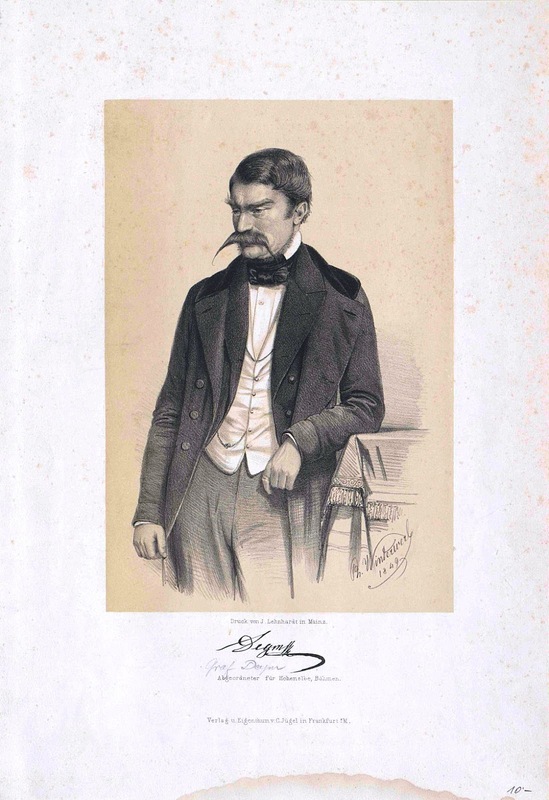 Friedrich Deym Count von Střítež died suddenly of "Lungenlähmung" (lung failure) on 23 January 1853. Regarding Friedrich von Deym's death and burial La Mara quotes the following sentence from Therese von Brunsvik's memoirs: "Fritz suddenly died in Vienna, universally mourned. His eleven children surrounded his coffin, the youngest a boy, two years of age, named Franz. "(La Mara 1909, 128). The number of Fritz's children given by La Mara has yet to be corroborated. That Friedrich von Deym was buried "II Classe" in an "eigenes Grab zwischen Bellmann u. Widtmann alt" ("second class burial an old[!] own grave between Bellmann and Widtmann") is documented in the 1846-1869 register of graves of the Währinger Ortsfriedhof. This "old grave" was his mother's. The entry in the register of graves in the Ortsfriedhof Währing concerning Friedrich von Deym's burial on 26 January 1853 in an "old own grave". Unlike the grave registers of the communal cemeteries the register of the Ortsfriedhof gives no grave numbers. The numbers beside the dates refer to houses in Währing (A-Wsa, Serie 1.2.4.3.1802, Währing Ortsfriedhof, B1-Gräber: alt: XVIII-B-1, fol. 25r). This register only covers the time from 1846 until 1888. No earlier records survive. On 23 February 1877 the Vienna Magistrate decided to have all the graves of historically significant or otherwise extraordinary individuals in Vienna’s cemeteries documented, and commissioned Karl Weiß, the head of the City Archive, with this project. 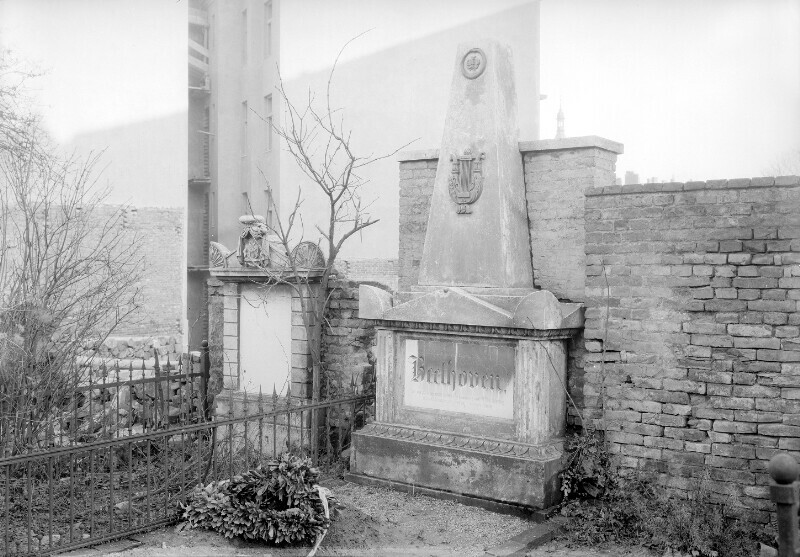 During the summers of 1877 and 1878 Weiß made lists of all the important graves in most of Vienna's cemeteries (including the inscriptions on their stones) and then transferred the task to his intern Franz Fiala who finished the project in 1880. Weiß's register also contains the grave of the Deym family, but only Friedrich von Deym's name is given, because – as the still existing Puthon grave shows – Weiß only recorded the names of the last person buried in each grave. Only this entry yields the information that the Deym family grave was located in the fourth row of the cemetery's old section. The entry reads: "4. row Deym Friedrich Count, Baron v. Střítež. 23. Jänn. 1853". 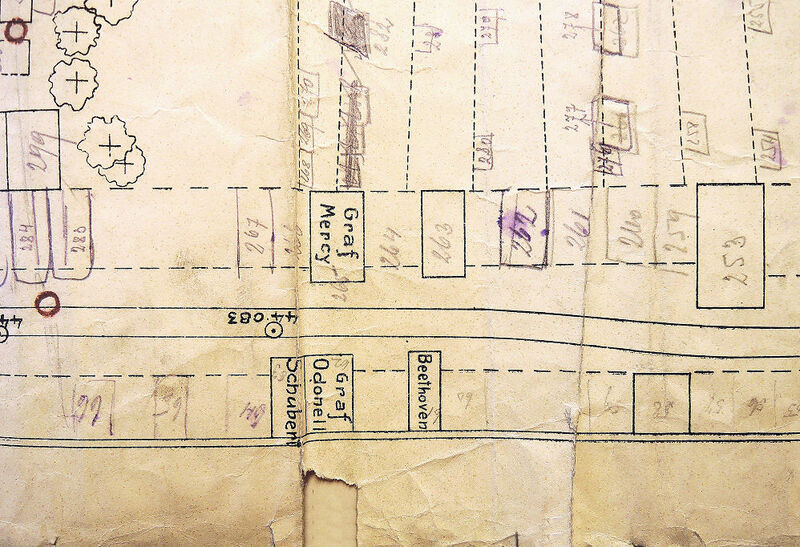 Since Weiß's register and the Gräberbuch do not provide grave numbers, it is not possible to determine the exact location of the Deym family grave. 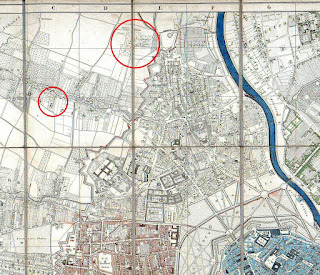 Furthermore Weiß's data concerning the exact location of the fourth row is at odds with the map of the cemetery from 1914. 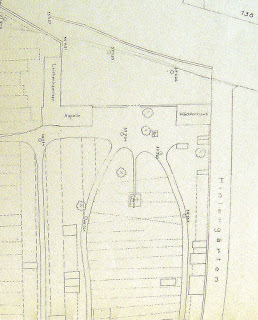 The following plan from 1913 shows the entrance section of the old cemetery. 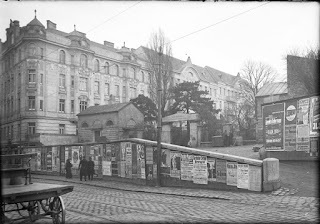 On top ist the Währingerstraße, to the left of the entrance are the "Leichenkammer" (which was torn down before 1923) and the chapel (which today houses a public restroom). To the right is the warden's house. 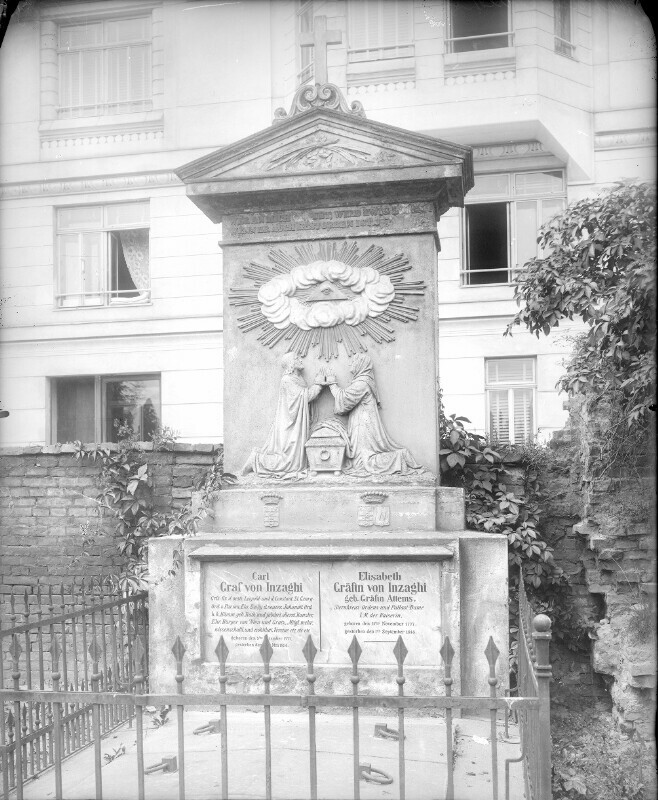 The grave with a cross above the supposed fourth row is that of the Schwab family (and of the parish priest Josef Maynollo) with its big crucifix by Balthasar Permoser that, until 1784, stood in the old Nikolaifriedhof on the Landstraße. Constance Spencer Smith, née Herbert Baroness Rathkeal (1785-1829), poetess and the object of one of Lord Byron's most famous love poems. She was the model of Florence in Childe Harold's Pilgrimage. 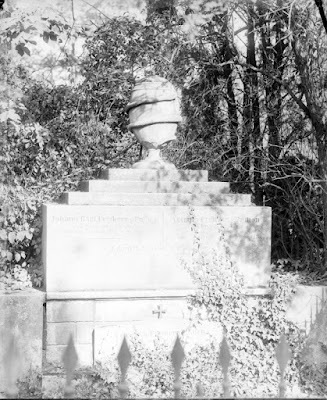 According to Hampeis and an essay in the Neues Wiener Journal from 1923, the front of her tombstone bore the last stanza of Byron's poem Euthanasia and the back side the first 12 lines of Byron's aforesaid poem from 1809. On 15 April 1896 Smith's remains were transferred to her nephew's grave in the Zentralfriedhof. 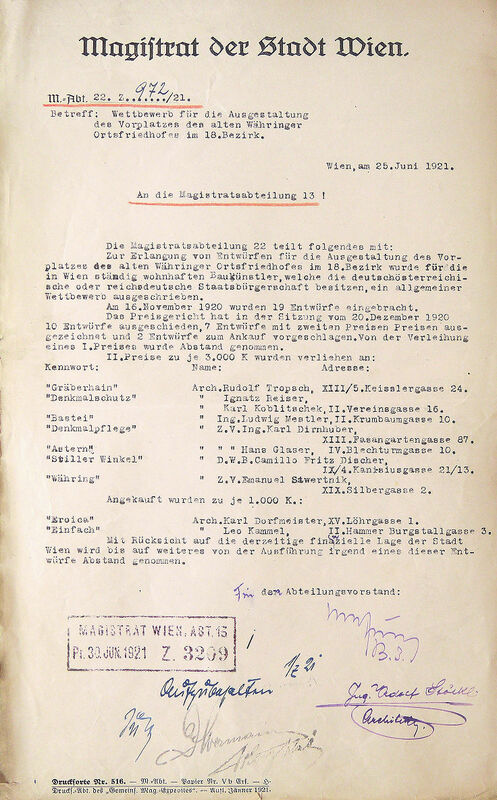 Still on 24 September 1919, the "Städtische Sammlungen" (the predecessor of today's Wienmuseum) asked the Magistratsabteilung X to look for the monument during the clearing of the cemetery, but it could not be found. In 1980 Spencer Smith's grave in the Zentralfriedhof was sold to new owners. Charles de Moreau whose headstone bore the inscription "Architecte, Chevalier de la legion d'honneur". This grave was located beside the Puthon grave. 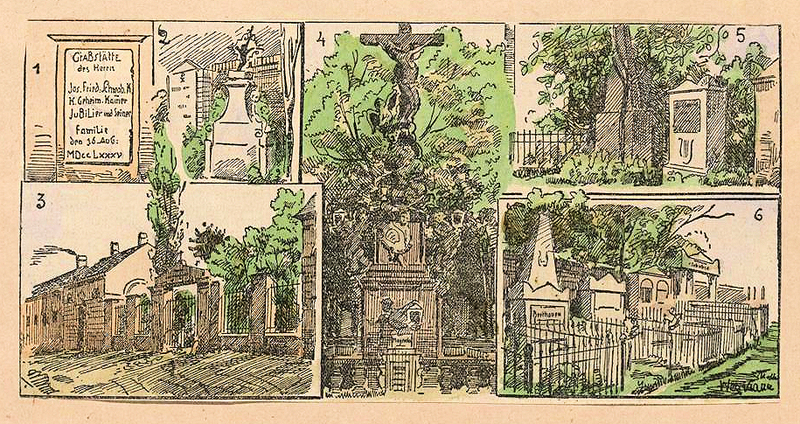 According to a list, drawn up in 1895 by Karl Glossy, Moreau's grave was meant to be preserved but it is now lost. The grave of Peter Mollner, whose location could not by identified by Hans Pemmer in 1970, is located at the foot of the pillar between the gravedigger's house and the entrance. Johann Baptist Baron von Puthon, the younger (1773-1839) (grandson of the Savoyan emigrant Louis Pouthon), merchant, head of the Austrian National Bank and the I. & R. privileged Donau-Dampfschiffahrts-Gesellschaft. Also buried in this grave are Puthon's wife, the pianist Antonia, née von Lilien (1781-1824) and her son Eduard (1803-1830) Antonia von Lilien was a piano pupil of Johann Jakob Heckel and a friend of Beethoven. 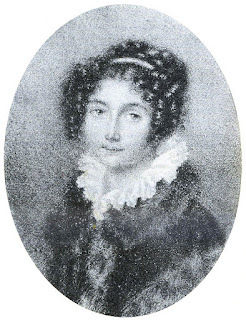 Alexandrine Baronne de Montet, in her memoirs, writes about Antonia von Puthon's death: "Notre chère Antoinette est morte jeune encore; son mari l'entoura dans sa dernière maladie des soins les plus tendres, les plus touchants. «Il m'aime donc, disait-elle à ma belle-mère en levant ses beaux yeux au ciel avant de mourir: je meurs consolée.» Elle mourut comme une sainte. Je la vis exposée sur un haut catafalque, dans un de ses magnifiques salons, belle comme un ange encore et paraissant endormie dans une douce pensée." The Puthon family grave is the only one in the cemetery's row four of which remains still survive. The remains of the monument of the Puthon family grave in the Währinger Ortsfriedhof (photographed in July 2017). In 1924 this monument was moved about 60 meters to the north. Only very few graves in today's Gräberhain are still in their original places. Among them are those of Neuling, Mollner, Fischer, Vering, Schlierholz, Sanguszko, Fabrice, and Rosenbaum. 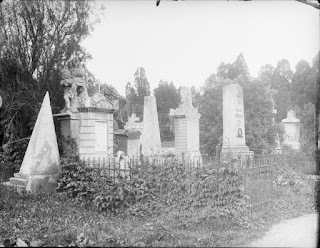 The following three photographs, taken before WWI, show how these rows of graves looked, several decades after the closing of the cemetery. Today's view from the entrance towards the Schwab family grave with the eighteenth-century crucifix. To the left of the Schwab grave is that of the Heurteur family whose stone bears a copper plaque paid for by the City of Vienna, although the grave is empty. On 16 October 1895 the family of the actor Nikolaus Heurteur was transferred to Waidhofen an der Ybbs. Their grave in Waidhofen has long been reassigned to other owners. 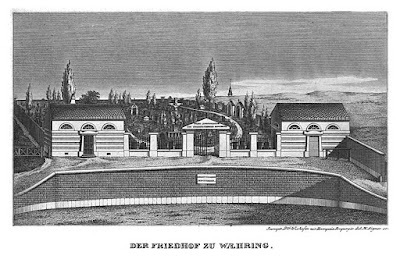 In 1821 the Währing village cemetery covered only about a half of today's Schubertpark. It consisted of today's separated Gräberhain and the southward area that reached to the Schulgasse. The width of the former cemetery area in relation to its final size can be seen on a view of the new entrance which in 1833 was published as frontispiece in Hampeis's book Chronologische Epigraphik der Friedhöfe Wien’s. The gravedigger's house and the chapel beside the cemetery's entrance which were built in 1827 (Hampeis 1833). Hampeis's book was dedicated to Johann Nepomuk Peter (1768-1838), administrator of the Leopoldstadt jailhouse, who was one of Joseph Karl Rosenbaum's accomplices in the thefts of the heads of Betty Roose in 1808 and Joseph Haydn in 1809. The grave of Peter and his first wife is preserved in the Gräberhain. The gravedigger's house and the chapel at the entrance of the cemetery were built but in 1827 by Adolph Korompay, the ramp was constructed in 1832. In 1841 the area of the cemetery was about doubled by the addition of a field, west of the cemetery, which had been purchased and donated by the wax monger Christoph Wishofer. The same area today, seen across the Währingerstraße: on the left is the old entrance area, on the right is the underground garage beneath the western part of the Schubertpark which in 2003 could only be built after the remains of thousands of bodies had been disinterred and transferred to Vienna's Zentralfriedhof. For a photograph that shows this ramp shortly before the opening of the park, see Das interessante Blatt of 4 June 1825. The owners of crypts and graves filed an appeal against this decree which was overruled by the City Captaincy. The last burial in the Währinger Ortsfriedhof took place on 11 August 1873 (A-Wsa, Serie 1.2.4.3.1802, Währing Ortsfriedhof, B1-Gräber: alt: XVIII-B-2, fol. 69v). As of this date, the register of graves only documents the hundreds of exhumations that were performed until the cemetery's final disbandment in 1919. 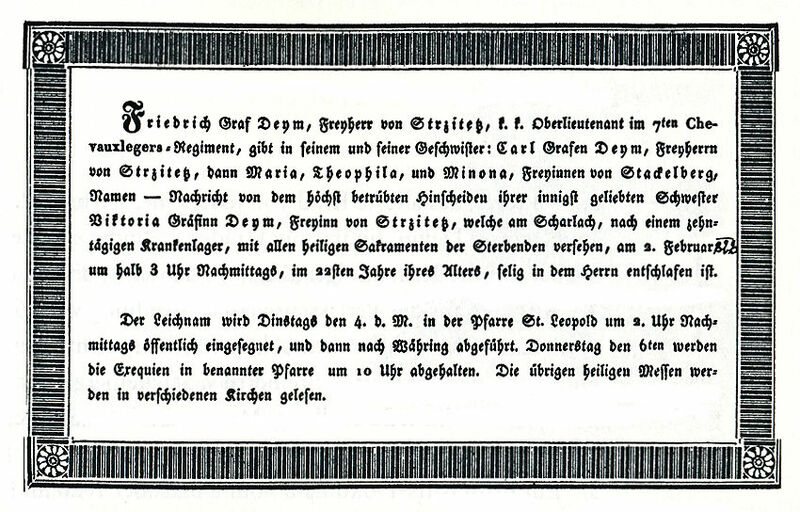 Two pages from the Gräberbuch of the Ortsfriedhof covering exhumations in 1876 and 1877. The first entry refers to the transfer of the remains of Joseph Böhm's wife to the grave of her husband in the Zentralfriedhof who had died a week earlier (A-Wsa, Serie 1.2.4.3.1802, Währing Ortsfriedhof, B1-Gräber: alt: XVIII-B-2, fol. 70v and 71r). From all over the Monarchy requests were submitted to the Magistrate to have relatives exhumed and transferred to other Viennese cemeteries. The Magistrate itself took care of the transfer of the most prominent persons, such as Beethoven, Schubert, Nestroy, Grillparzer, van der Nüll, Frank, Lampi the Elder and [possibly] the Younger, Antonie von Arneth, von Heß, and Megerle von Mühlfeld. Whole families were exhumed to Hietzing, Meidling, or the Zentralfriedhof, many of whose graves were still to be forgotten and lost in the course of the following decades. The many exhumations made it necessary to extend the deadline of the closing several times. These extensions also applied to the Allgemeiner Währinger and the Schmelzer Friedhof which were scheduled to be disbanded at the same time. 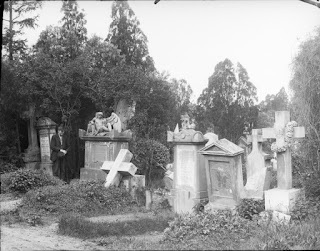 In August 1896 the deadline of the complete clearing of the cemetery was extended to 31 December 1897. 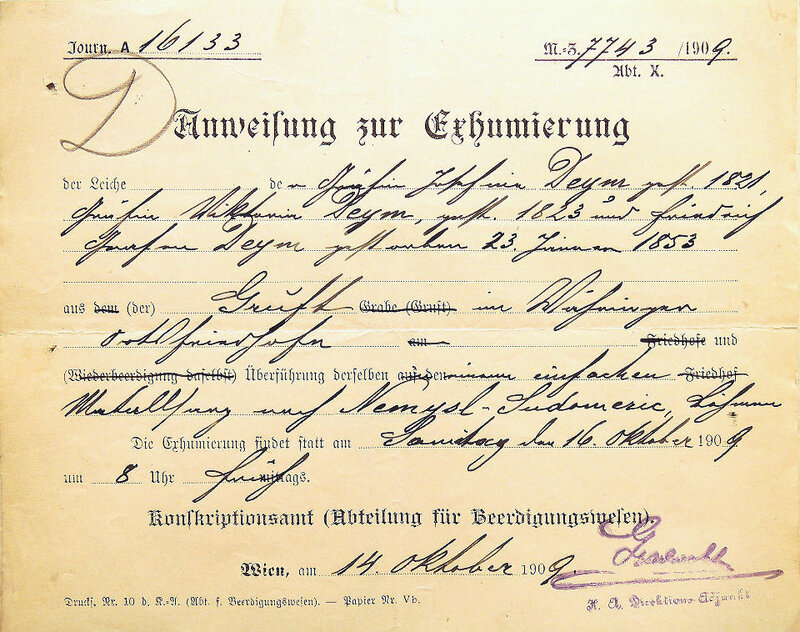 On 2 September 1912 the Währing parish and the City of Vienna signed a contract whereby the cemetery was sold to the City for 640,000 kronen. The two parties agreed that the money had to be invested in the construction of a new parish church and that the amount had to be paid in two installments in 1913 and 1914. Owing to objections from the Central Commission for the Preservation of Historical Monuments and the ministry of cultural affairs the City of Vienna, however, was unable to get the purchase contract approved. In 1913 the transaction was suspended and after the beginning of the war the Magistrate postponed the closing of the cemetery for an indefinite period of time. The exact circumstances of the final change of ownership are difficult to ascertain. 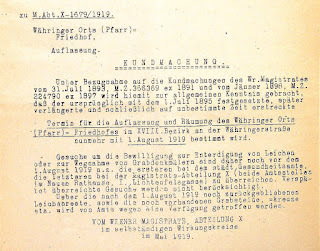 In May 1919 the City of Vienna claimed her right of ownership according to the 1912 contract and seems to have paid several billions of kronen for the cemetery. The legal dispute between the parish and the Magistrate continued until 1924. 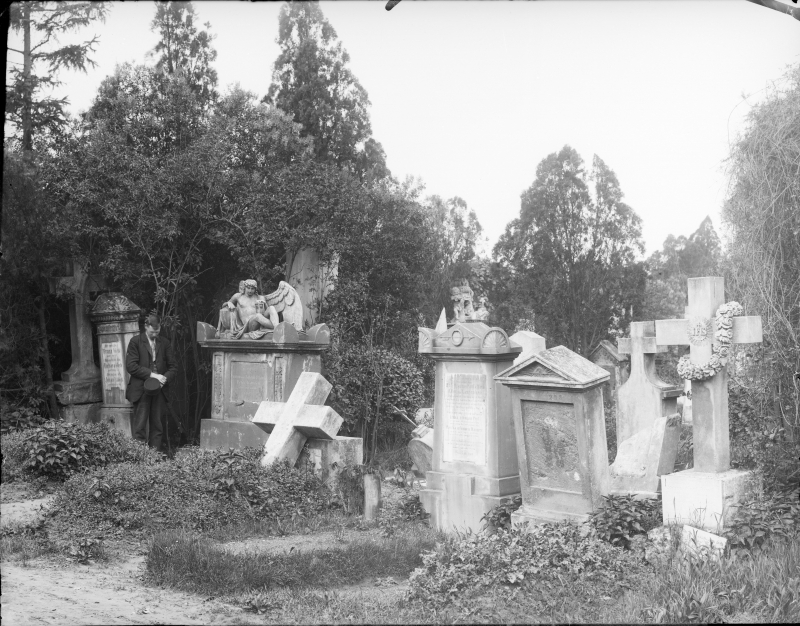 In May 1919 the final date of the closing of the cemetery was set at 1 August 1919. The municipal administration now began to realize the cemetery's transformation into a public park, a project that dated back to 1913. The following two plans, drawn by the Wiener Stadtbauaumt in May and October 1913, show the two states of the cemetery, before and after its projected transformation into a public park. The left design shows many crypts in their original location. 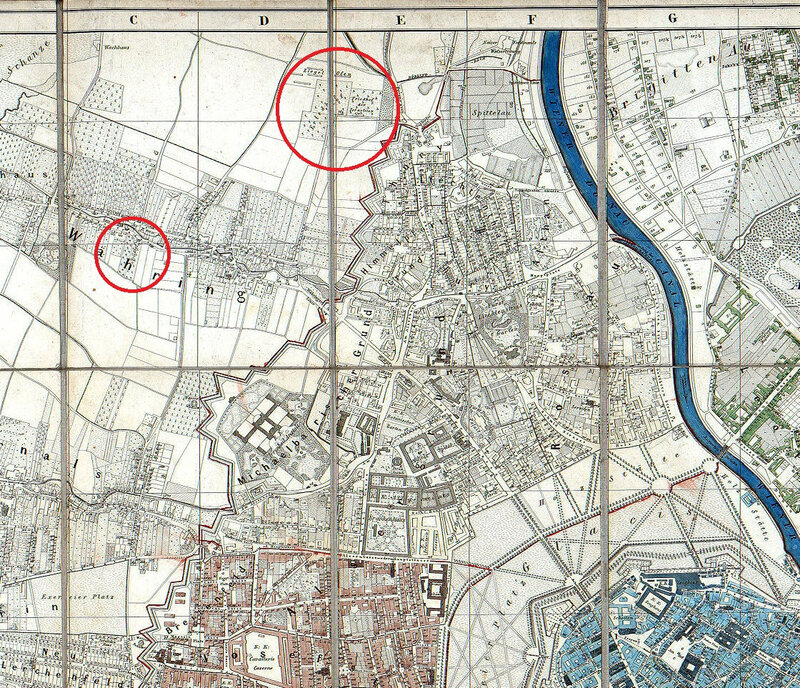 At the right margin, circled in red, are the graves of Beethoven and Schubert, with the crypt of Count John O'Donnell (1762-1828) still between them, because it was a "Stiftungsgrab" which was meant to be preserved. The design on the right shows the first park project with many graves still in their original places and a rondeau in the center. For reasons of piety this project was never realized. As one official put it: "To have children's playgrounds beside graves is not acceptable". 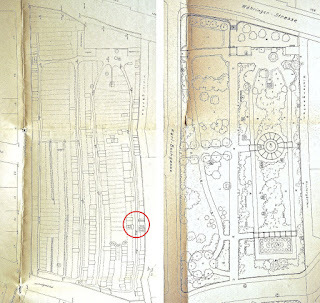 Two plans of the area of the Währinger Ortsfriedhof drawn by the Wiener Stadtbauamt in May and October 1913 with Beethoven's and Schubert's graves circled in red (A-Wsa, Serie 1.3.2.213.A3, Sonderfaszikel 5, Währinger Ortsfriedhof). The Schulgasse is at the bottom,the then Karl-Beck-Gasse at the left (west of the cemetery) is today's Teschnergasse. For a comparison with today's situation, see a current satellite photo of the park. 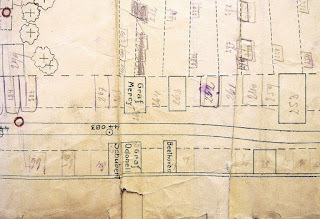 A previously unpublished map of the cemetery from 1914 shows all the remaining graves with their numbers which, with the help of a handwritten list, can be attributed to the buried individuals. Since the Deym family grave was disbanded in 1909, it does not appear on this map. 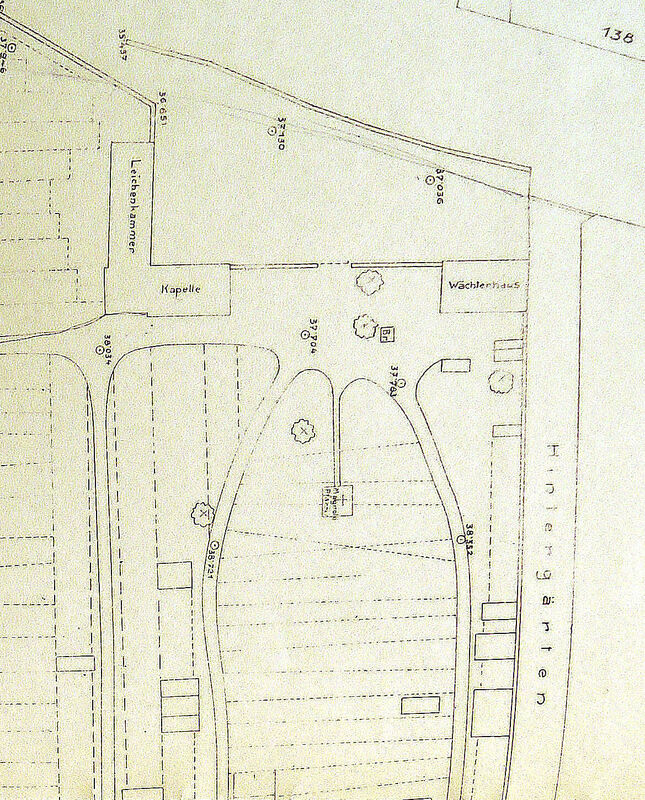 A map of the Währinger Ortsfriedhof from 1914 showing all crypts and graves that still existed at that time (A-Wsa, 1.1.10. Totenbeschreibamt, A5, Friedhofsabräumungen). The path along the left (west) side was called the "Inzaghigang". It is particularly interesting to see who was buried in the vicinity of Schubert's and Beethoven's first graves. The crypt of the Hardmuth family and Baroness Marie Schlechta von Wschehrd (1869-1872), between O'Donnell and Beethoven, was vacated in 1895 (for a photograph of the memorials see A-Wn, 166.861-B). Opposite O'Donnell's crypt was that of Comte Andreas Florian de Mercy (1772-1840) and his wife Marianne, née von Stadion (1777-1833). Buried in grave No. 64, to the left (south) of Schubert, was Joseph Pompe (1787-1831), a privy councilor who was employed at the I. & R. lotto office. This was certainly not a coincidence, because Pompe was a music aficionado and a close friend of Joseph von Spaun. 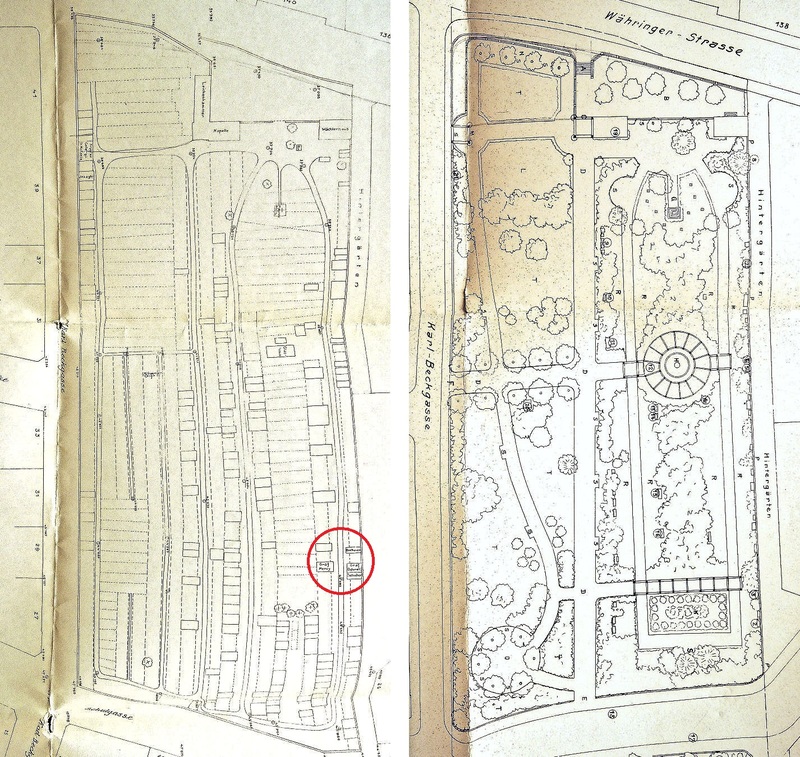 On the other side of Pompe's grave, until its transfer tom the Zentralfriedhof in 1887, the crypt of the Metaxa family had been located (hence it is missing in the below map). Grave No. 60, right (on the below plan) of Beethoven's, was the crypt of the Oettingen-Wallerstein family. Buried in grave No. 263, opposite Beethoven, was the composer Ignaz von Seyfried. Right beside Seyfried's grave was that of Franz Clement (No. 262). A colored newspaper clip in one of Karl Blaschke's albums in the Wienbibliothek shows these two graves still in their original location. In 1924 Seyfried's and Clement's headstones were moved north into the Gräberhain where they now stand five meters apart facing opposite directions. The question of what to do with artistically important graves, of which twenty-five were so-called "Stiftungsgräber" (foundation graves), led to years-long discussions between the municipal instances and the parish which was a contracting party of most of these foundations. 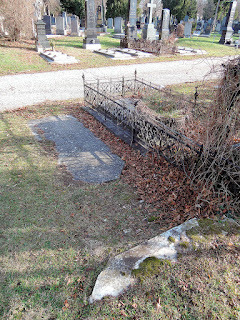 Some of these graves were preserved (Inzaghi, Peter, Rosenbaum), the remains of the other owners of foundation graves (such as Nestroy's sister Franziska and her daughter, Johanna Princess Bretzenheim von Régecz) were (allegedly) transferred into a newly installed crypt in the Währing parish church. 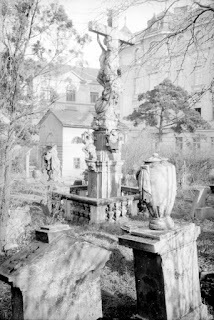 The City's efforts to preserve the graves of historically significant people were hampered by the circumstance that the exhumation entries in the Gräberbuch end in 1888 and the department X had not archived a full set of records concerning the exhumations that had already taken place. 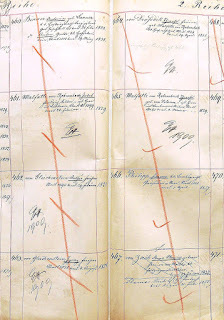 Mathias Zehrnpfennig's last entries in the Gräberbuch of the Ortsfriedhof covering the exhumations between 5 April and 25 June 1888. The next to last entry reads: "Den 21 Juni 1888 ist der Dondichter Ludwig von Beethoven in Zentralfridhof. überführt worden. Dt Witlscha [Doktor Witlaschil] Beethoven." 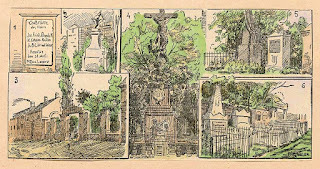 (A-Wsa, Serie 1.2.4.3.1802, Währing Ortsfriedhof, B1-Gräber: alt: XVIII-B-2, fol. 75v). In 1920 the City of Vienna tendered a competition among architects concerning the design of the park and the preservation of some of the memorials. From the nineteen designs that were submitted the jury discarded ten, awarded the 2nd prize (3,000 kronen) to seven of them, and proposed two for purchase. No 1st prize was awarded. 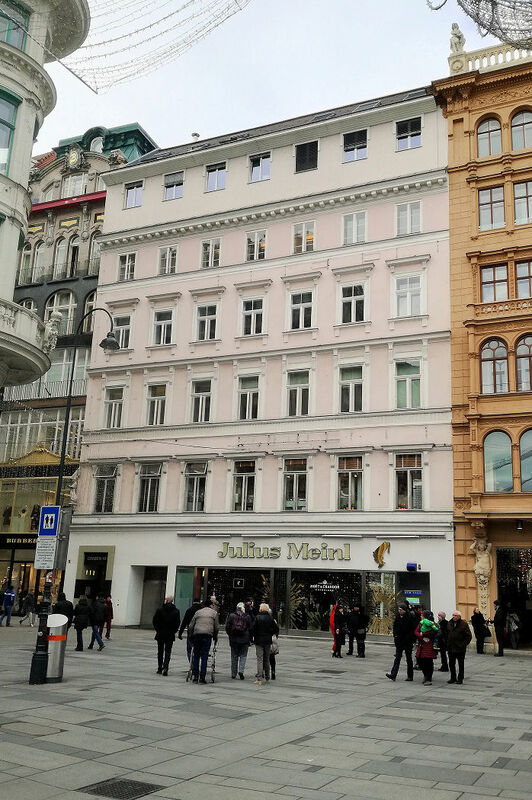 The official report from the Magistratsabteilung 22 closes with the statement: "With regard to the current financial situation of the City of Vienna none of these designs will be realized for the time being." In 1924, eventually, Karl Dirnhuber's design "Denkmalpflege" was realized. The overall cost of the project amounted to 2,17 billion kronen. Dirnhuber also designed the residential building Weimarer Straße 1 which is located east of the park, behind the empty graves of Beethoven and Schubert. The reburial of of countless remains and the relocation of some of the graves was accompanied by a number of gruesome incidents that were caused by lack of sufficient closure of the cemetery grounds. 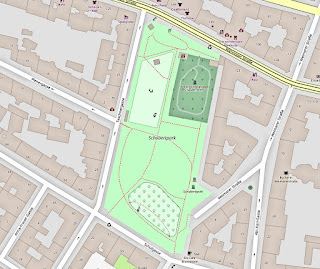 On 7 June 1925 the Viennese mayor Karl Seitz opened the Schubertpark. On this occasion he planted an oak tree. 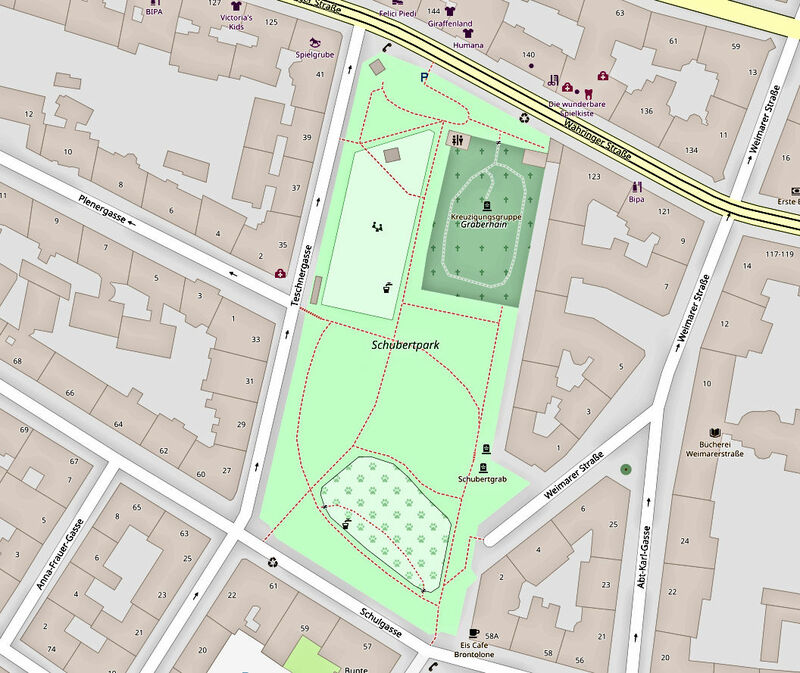 A map of the Schubertpark today: the dark green area is the walled Gräberhain the round area with the shrub symbols at the bottom marks a dog park. A view across the Schubertpark towards north-east in November 2017: on the left, behind the wall is the Gräberhain with the top of the Inzaghi monument (which once was located at the cemetery's western wall) visible behind the wall. 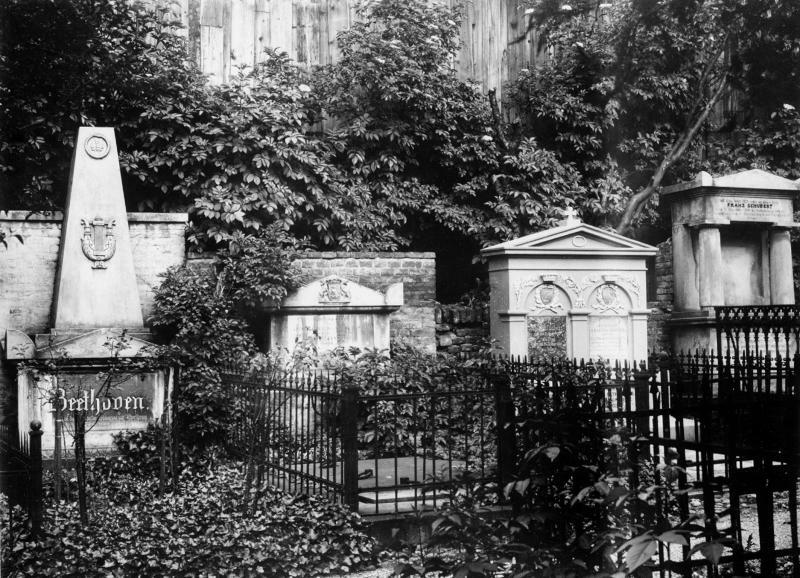 On the far right, at the former cemetery's eastern wall, are the kenotaphs of Beethoven and Schubert. Visible in the foreground is a part of the dog park. 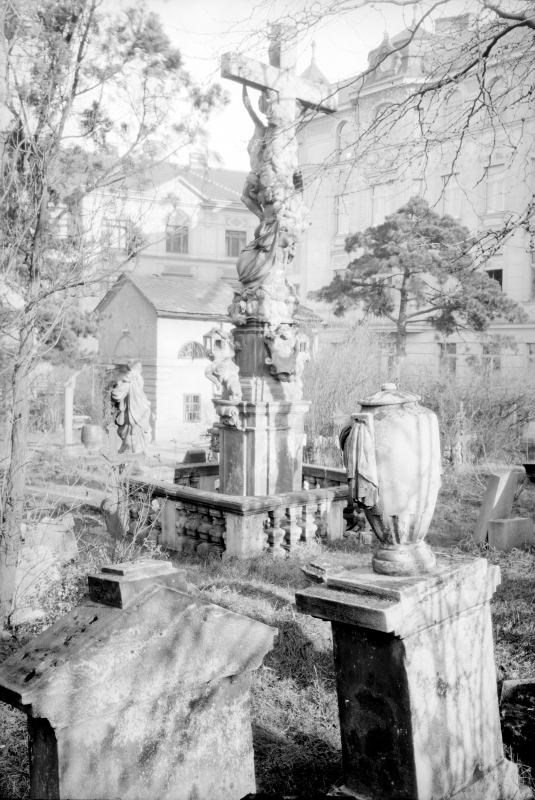 In October 1909 the Deym descendants of Josephine von Deym – probably her great-grandson Ottokar von Deym – commissioned the mortuary of Josef Klammerth to disinter their grandmother and her two children Victoire and Friedrich and transport their remains to the Deym family estate in the Bohemian village of Nemyšl. The procedure had to follow strict regulations: the exhumation had to be performed in the presence of the district physician (in this case Dr. Moritz Breuer [1848-1918]), the metal coffin, wherein the remains of the three exhumed individuals were to be transported, had to be soldered airtight, put into a wooden coffin, and had to be accompanied on the train to Bohemia by an attendant. Furthermore, the transport had to leave Vienna early enough to allow the reburial on the very same day. 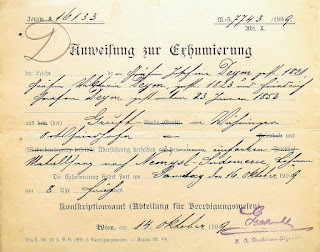 The costs of such an exhumation are documented in the papers related to the disinterment of members of the Schlechta/Hardmuth family in 1895. The attending physician cost 5 gulden in addition to which an aptly-named "Beilagengebühr" of 50 gulden was charged. 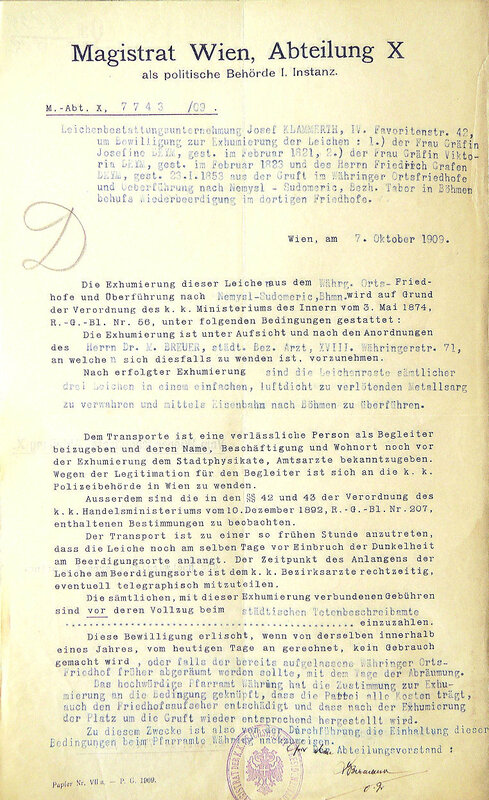 On 7 October 1909 the permission to have the Deym family exhumed from the grave in Währing was granted by the Vienna Magistrate. as political authority of the 1st instance. The undertaker firm Josef KLAMMERTH, IV. Favoritenstr. 42, [applies] for the exhumation of the bodies: 1.) of Countess Josefine DEYM, deceased in February 1821, 2.) of Countess Viktoria DEYM, deceased in February 1823 and of Fiedrich Count DEYM, deceased on 23 January 1853, from the crypt in the Währing village cemetery and the transport to Nemysl–Sudomeric, district of Tabor in Bohemia for the purpose of a reburial in the local cemetery. The exhumation of these bodies from the Währing village cemetery and the transfer to Nemysl–Sudomeric in Bohemia is being permitted, based on the decree of the I. 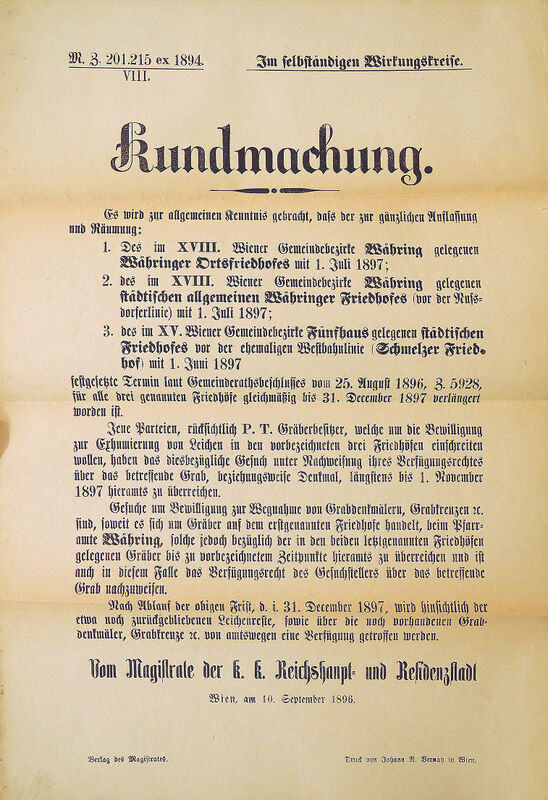 & R. Ministry of Interior of 3 May 1874, Reichs-Gesetz-Blatt No. 56, under the following conditions: the exhumation is to be performed under the supervision and according to the orders of Dr. M. BREUER, municipal district physician, XVIII. Währingerstraße 71, who has to be consulted in this case. After the exhumation, the remains of all three bodies are to be kept in a simple coffin that has to be soldered airtight and are to be transferred to Bohemia by rail. The transport must be accompanied by a reliable individual as attendant whose name, profession and address has to disclosed to the public health department and the public health officer. Regarding the credentials of this attendant the I. & R. police authorities have to be contacted. Furthermore, the regulation in § 42 and 43 of the decree, issued by the I. 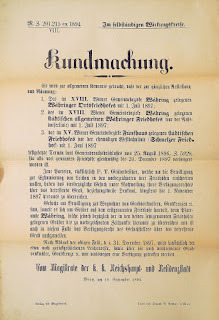 & R. Ministry of trade of 10 December 1892, Reichs-Gesetz-Blatt No. 207, must be observed. The transport has to be scheduled at an early enough hour so that the body will arrive at the location of the burial on the same day before nightfall. The time of the body's arrival at the burial location has to be communicated in time to the I. & R. district physician, eventually by telegraph. All fees related to this exhumation must be paid before the procedure at the municipal coroner's office. This permit expires, if it is not put into use inside one year's time from today, or on the day of the clearing, if the Währing village cemetery should be cleared earlier. The honorable Währing parish office has attached the permit for the exhumation to the condition that the party will bear all the costs, that the cemetery warden will be reimbursed, and that after the exhumation the area around the crypt will be put in order again. For that purpose, compliance with these conditions has to be documented at the Währing parish office. On 14 October 1909 an exhumation assignment was issued by the department of funerary affairs of the municipal conscription office. Journ. A 16133 M.=Z. 7743/1909. / Abt. X.
of the bodies of Countess Josefine Deym, deceased in 1821, Countess Viktoria Deym deceased in 1823 and Friedrich Count Deym deceased on 23 January 1853 from the crypt in the Währing village cemetery, and their transfer in a simple metal coffin to Nemysl–Sudomeric, Bohemia. The exhumation will take place on Saturday, October 16th, 1909 at 8 a.m.
Conscription office (department for funerary affairs). In the morning of 16 October 1909 the remains of Josephine, Victoire, and Friedrich von Deym were taken to the Franz-Josefs-Bahnhof from where they were transported with the Franz-Josefs-Bahn to Sudoměřice u Tábora. 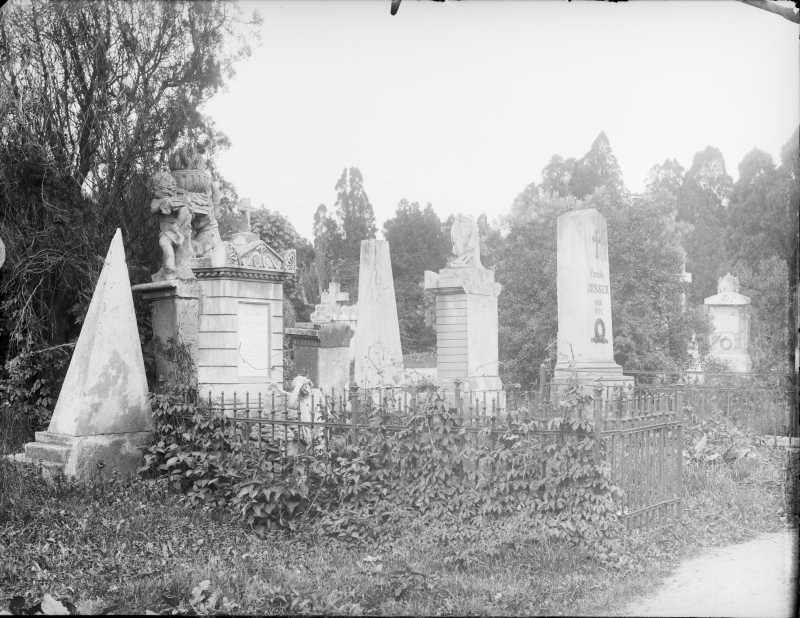 Concerning Josephine von Deym's and her two children's final resting place in Bohemia there are two possibilities: since Nemyšl has no own cemetery, the coffin was either transported to the parish village Chotoviny where it was buried in the local cemetery, or – more likely – taken to Nemyšl and put into a private family crypt. Further research will be necessary concerning the exact location of Josephine von Deym's final resting place. 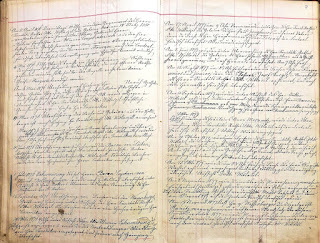 The 1909 burial records of the Chotoviny parish have not yet been transferred to the Třeboň Regional Archives, but, since reburials did not demand a religious ceremony, it is unlikely that these records will offer any new information. Josephine von Deym was not the only one of Beethoven's piano pupils whose remains were to be exhumed in the twentieth century. 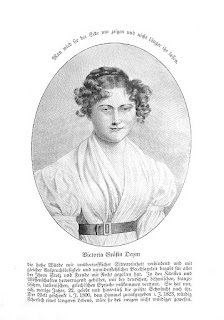 On 22 March 1856, at 2.45 p.m., Julie Countess von Gallenberg née von Guicciardi – Josephine von Deym's cousin and the dedicatee of Beethoven's Piano Sonata No. 14 – died of old age in the house Stadt 322 ("Zum Hahnenbeiß", today Am Hof 5). On 25 March 1856 she was consecrated in the Kirche Am Hof (Am Hof 5, fol. 26) and transported across the Nussdorfer Linie where she was buried in the Währinger Allgemeiner Friedhof, in an own grave in row 23. The costs of this procedure are documented in Countess Gallenberg's probate records: her burial cost 265 gulden, the tombstone 95 gulden and 40 kreuzer. The costs of Julie von Gallenberg's burial and her tombstone listed in her 1856 Sperrs-Relation (A-Wsa, BG Innere Stadt [I], A4, A 1173/1856). It is to be noted that at the time of her death Julie von Gallenberg did not own a piano. 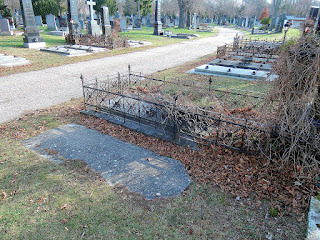 In 1858 and 1864 Julie's sons Joseph and Hector von Gallenberg were also buried in this grave. Her four other children (Hugo, Marie, Friedrich, and Alexander) died outside of Vienna. 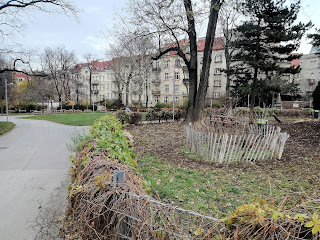 When in 1923 the Währinger Allgemeiner Friedhof was converted into a public park (today's Währingerpark), the 280cm-tall granite monument was transferred to a separate fenced area which (like in the Schubertpark) is today's Gräberhain. The note "Siehe wie bei Grab N° 1322" in the following entry in the register of graves refers to the grave of the general of the branch Joseph Baron von Lauer whose remains, on 24 August 1923, were exhumed and reburied in what was then called "Gedächtnishain". Julie von Gallenberg's date of birth, 23 November 1784, which also appears on her tombstone, has recently been described as being two years too late (Steblin 2009). However, since all Viennese sources, such as Guicciardi's marriage entries, her probate file and her tombstone (which Steblin fails to address) give 1784 as her year of birth, for the year 1782 to be correct, Julie Guicciardi's birth certicifate must have been a falsification. Dorothea von Ertmann, arguably Beethoven's best piano pupil and the dedicatee of his Piano Sonata No. 28, died on 16 March 1849 in the house Stadt 243 (today Strauchgasse 1). As the cause of her death the records give "Übersetzung des Krankheitsstoffes auf das Gehirn" (transfer of the contagious matter to the brain). On 18 March 1849 Ertmann was consecrated in the Schottenkirche and transported to the Währinger Allgemeiner Friedhof where she was buried in the twelfth row. The register of graves of this cemetery describes her headstone as "1'20 M. S." (1,20 meters tall, sandstone). In August 1823 the remains of Baroness Ertmann were disinterred, her monument was transferred into the "Gedächtnishain" and she was reburied under the monument (whose plaque is now lost). Dorothea Baroness von Ertmann's grave in the Gräberhain of the Währingerpark. Ertmann's husband is not buried in Vienna, he died in 1835 in Milan. Therese Baroness von Droßdik, née Malfatti, ennobled von Rohrenbach zu Dezza, was one of the most colorful members of of Beethoven's circle of friends. The fact that Beethoven at some time allegedly planned to propose to her, or that she has been presented as possible dedicatee of the bagatelle WoO 59, Für Elise, cannot be addressed in this blog post. Regarding this topic I refer to three of my publications (Lorenz 2001, 2011, and 2013). Like the aforementioned Josephine von Deym, Julie von Gallenberg and Dorothea von Ertmann, Therese von Droßdik, too, was not allowed to remain in her first grave. 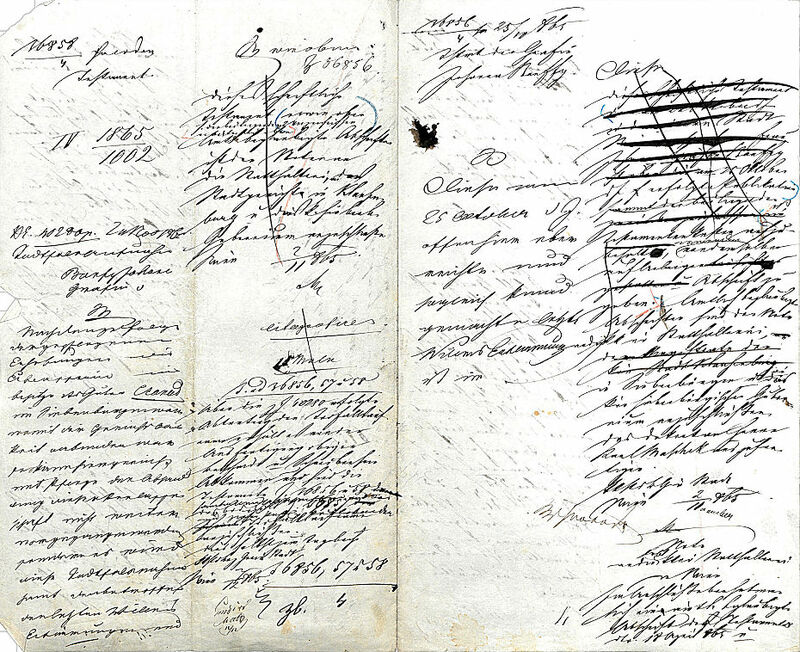 A clip from Therese von Droßdik's will where she refers to her burial (A-Wsa, Landesgericht f. ZRS, Testament 1121/1844). This text was first published in Lorenz 2001, 80. [...] ferners ersuche ich mein Leichenbegängniß so wie bereits gesagt so einfach wie möglich nehmlich 3ter Claße eine fromme Seelenmeße, u. ein eigenes Grab zur Beerdigung, wo möglich an der Seite meiner entschlafenen Eltern. 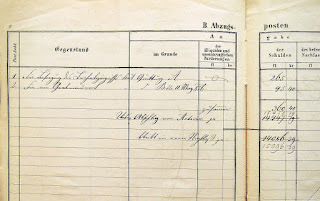 The note "Ex 1909" in the entries concerning these five graves in the Matzleinsdorf grave register shows that the above people were exhumed in 1909. It is not known where the remains of these prominent individuals were reburied, neither is it known who commissioned the disinterment. It would seem likely that the Gleichenstein family initiated the procedure. My inquiry with this family in Vogtsburg-Oberrotweil, however, was met with great surprise. The Gleichensteins were completely unaware of the exhumation of the most prominent member of their family. 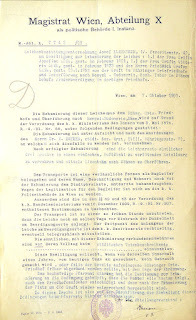 The entry concerning the graves of five members of the Malfatti von Rohrenbach, von Gleichenstein, and von Droßdik family in Matzleinsdorf and their exhumation in 1909 (A-Wsa, Serie 1.2.4.3.4.B2.1 alt: II-D-2, Eigene Gräber, fol. 30v and 31r). The Antonia Binner, née Lanner, who appears at the top left as having been buried in 1828 in grave No. 460, was an aunt of the composer Joseph Lanner. 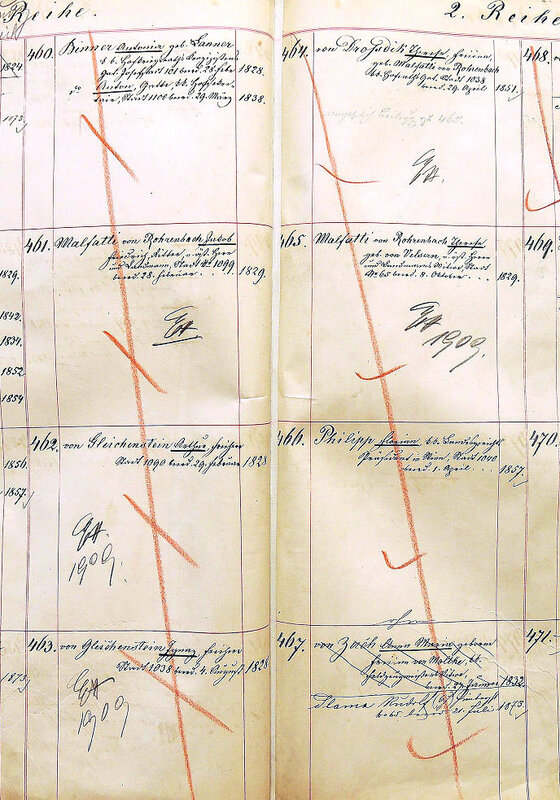 The grave registers pertaining to reburials in 1909 in the Zentralfriedhof, held by the Vienna City Archive, are currently inaccessible due to severe mold damage. The records in the archive of the Friedhöfe Wien GmbH, which I have not been able to check, will certainly provide more information. The results of this research will be of small relevance however, because, since the five Gleichenstein/Malfatti graves do not appear in Vienna's database of graves, they must have been vacated at some point in the twentieth century anyway. In 1954 Siegmund Kaznelson presented the hypothesis that Josephine von Stackelberg's daughter Minona could have been an illegitimate child of Beethoven. This theory was not entirely unsubstantiated. After all, Christoph von Stackelberg had supposedly left his family in June 1812, and Minona was born on 8 April 1813, nine months after that supposed night of love on 3 July 1812 in Prague which, a few days later, triggered Beethoven's epistolary outburst. While the French historians Jean and Brigitte Massin considered Kaznelson's idea quite sensible, to some established Beethoven scholars the actual existence of a child of Beethoven appeared much too sensational and adventurous to be accepted as a tenable scenario. Most of the current Josephine advocates are now convinced that Minona von Stackelberg was Beethoven's daughter and they have expressed this belief in several publications. What do Countess Bánffy's soirées have to do with Josephine von Stackelberg and Beethoven's Immortal Beloved? Closer research on Dionys and Johanna Bánffy de Losoncz reveals that Minona von Stackelberg, Beethoven's alleged daughter, lived in the Bánffys' home. She actually made Franz Liszt's acquaintance, because she was present at the aforesaid soirées. After Christoph von Stackelberg's death in 1841, his daughters Maria Laura and Minona moved to Hosszufalu (today Satulung in Romania) where their aunt Charlotte Teleki von Szék lived on her estate. Maria Laura died there in 1843, followed shortly by her aunt (Josephine's sister) Countess Teleki. Minona now went to Vienna where she moved in with the Bánffy couple at Stadt 281. Stadt 281 (Graben 19), the venue of the soirées of Countess Bánffy, where in 1856 and 1858 Minona von Stackelberg met Franz Liszt. This house was built in 1799. It is possible that there had been some family relationship between the Stackelberg and the Schilling von Cannstatt families (after all, Johanna von Bánffy was born in Reval). Minona von Stackelberg became Countess Bánffy's lady companion. 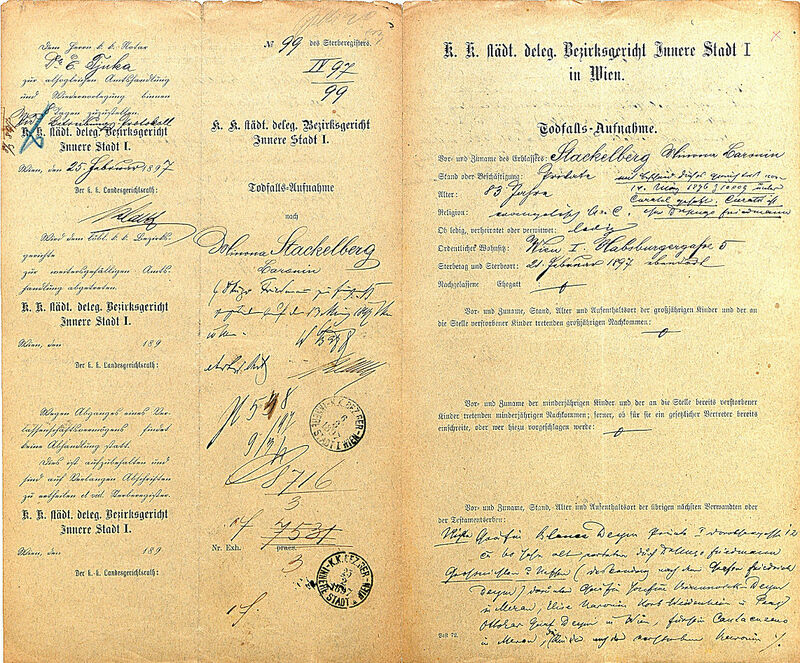 That she shared the apartment with the Bánffys is proved by two entries in two conscription sheets of Stadt 281. First, in 1857, Countess von Bánffy is registered as tenant of apartment No. 6 and "KK. Sternkreuzordensdame & Gutsbesitzerin [from] Rewall in Rußland". A note on the far right of the sheet (not visible in the below picture) reads: "Gemahl Graf Zionis[sic] Banffy 854 in Wien gestorben. 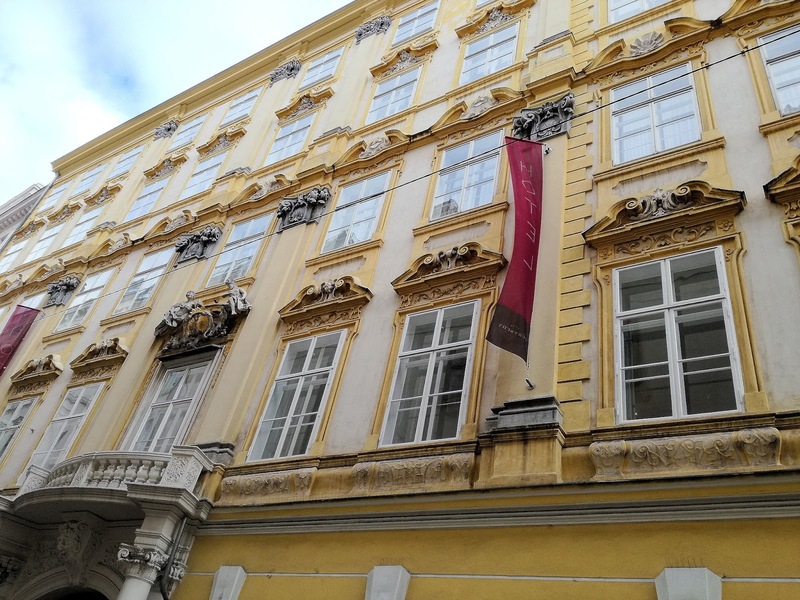 die Familie wohnt seit 40 Jahren in Wien." (The husband Count Dionys Banffy died in 1854 in Vienna. The family has been living in Vienna for 40 years). 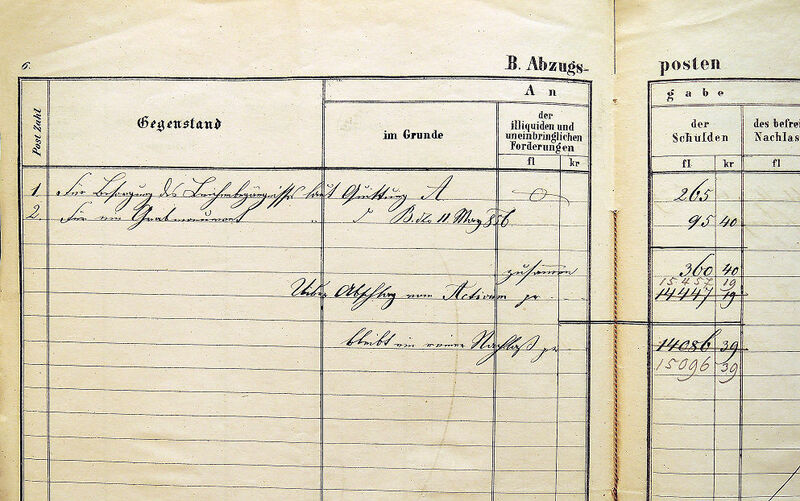 Minona von Stackelberg's name appears in the Fremdentabelle (table of foreigners) as resident of apartment No. 6, because she erroneously was considered a relative from Russia. The entry reads: "[apartment] 6 Minona Freiin von Stachelberg 820 Anverwandte Rußland [Religion: Evangelisch Augsburger Confession] [Ist im Besitze eines Reise=Dokuments] Ausl[änderin]". The other nine cohabitants of apartment No. 6 were the family physician Carl Erberg and other domestic staff. Count Dionys von Bánffy de Losoncz died of old age on 3 July 1854, at 9:15 p.m. (St. Michael 13, fol. 89) and was buried first class on 6 July in an own crypt in the Währinger Ortsfriedhof along what was to become known as the "Bánffygang". 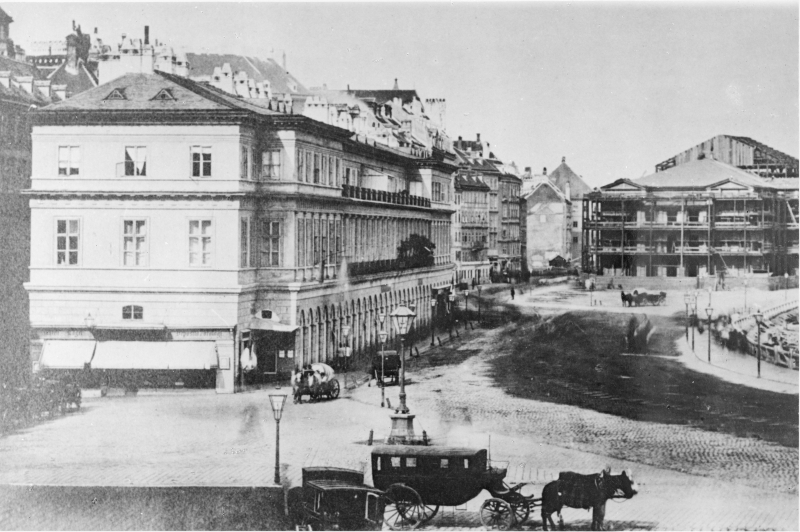 At some time between 1861 (Lehmann 1861, 9) and 1864 (Lehmann 1864, 99), Countess Bánffy downsized her household and, together with Minona von Stackelberg, moved to Graben 10. There, on 22 October 1865, at 5 p.m.(St. Michael 13, fol. 174), the Countess died of old age and on 25 October was buried in the family crypt in Währing (Währing 6, fol. 312). 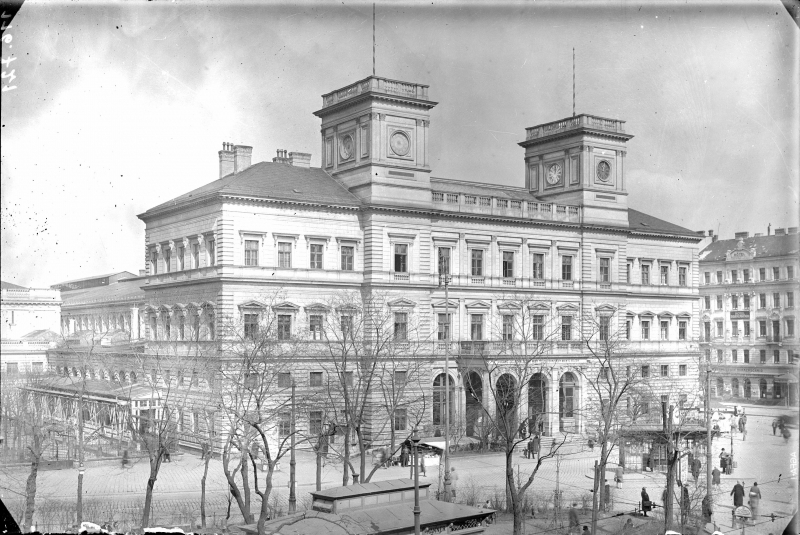 Countess Bánffy's main assets consisted of real estate near Klausenburg (today Cluj-Napoca). On 25 July 1896 (according to the municipal database), Dionys and Johanna von Bánffy were exhumed from their crypt in Währing and transferred to a new crypt in group 48A in the Zentralfriedhof. This transfer was certainly initiated by one of their many Hungarian relatives. It is not known if the original headstone was also moved to the Zentralfriedhof. After Countess's Bánffy's death, Minona moved to Habsburgergasse 5 (the Cavrianisches Haus) where on 21 February 1897 she died of "hypostatic pneumonia" (A-Wsa, Totenbeschreibamt 557, 1024f.). 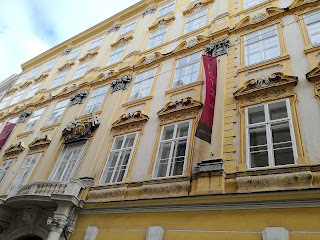 Minona von Stackelberg's last residence, Habsburgergasse 5. This is not an address of somebody who is in dire financial circumstances. Today this building houses the 4-star Pertschy Palais Hotel. Her Sperrs-Relation and the entry concerning her consecration in the records of the protestant Stadtpfarre show that Minona, in spite of having been baptized Catholic, had been raised in her father's confession of faith (Lutherische Stadtkirche 17, 29/1897). 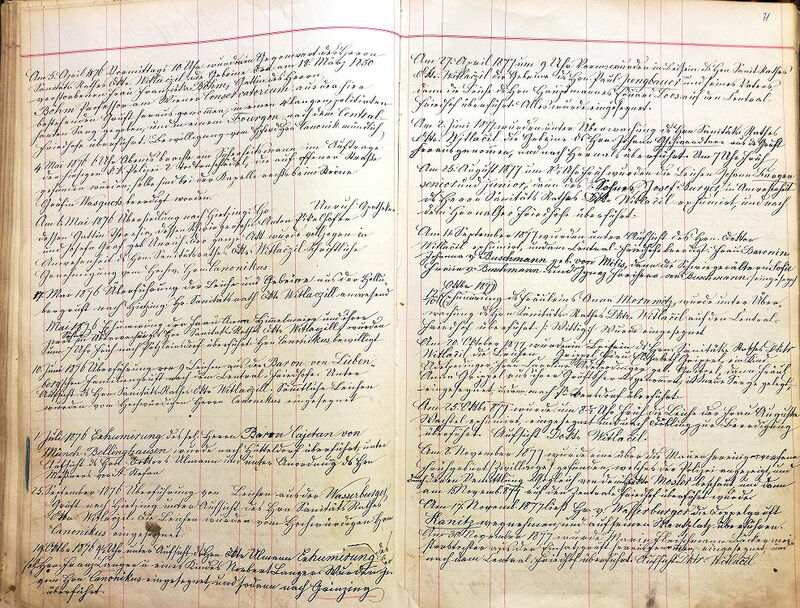 Minona von Stackelberg's probate file sheds light on her late years and her financial situation. On 14 March 1896 the district court had put her into guardianship of the lawyer Dr. Hugo Friedmann, due to a mental incapacition which is already addressed in the literature (La Mara 1920, 80). 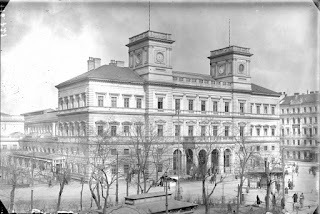 Unfortunately the file pertaining to this court decision – which contained a detailed genealogical chart – is not preserved (the Kuratelsakten of the BG Innere Stadt only survive as of 1898). Minona's main heir was her niece Countess Blanca von Deym (1832-1906), a daughter of Minona's half-brother Karl von Deym (1802-1840). The other heirs were Minona's grandnieces and grandnephews, the following grandchildren of Friedrich Deym Count von Střítež: Countess Josephine von Deym in Merano, Baroness Elise von Korb-Weidenheim in Prague, Count Ottokar von Deym in Vienna, Princess Cantacuzino in Merano, the children of deceased Baroness von Blittersdorf, and "Hungarian relatives of a born Countess Brunsvik after a Count Emerich Teleky". Minona's alleged "depressing economic situation", described in 1920 by La Mara, was obviously based on flawed information that La Mara had received from Countess Constanze Cappy (La Mara 1920, 8). 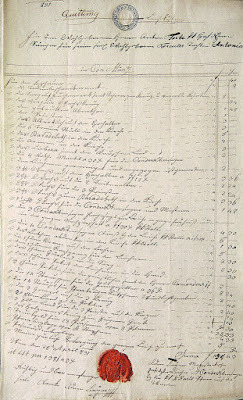 At the time of her death Minona von Stackelberg enjoyed an annual income of 1,470 gulden which consisted of two lifetime annuities: First, from Countess Bánffy Minona drew a lifetime annual pension of 1,050 gulden that the Countess had bequeathed to her friend Minona in her will dated 18 April 1865. 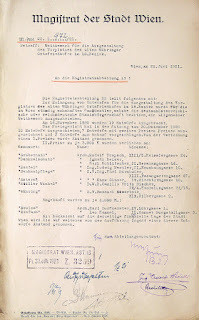 50 fl of this pension were regularly put into an account of the Klausenburger Sparkasse. 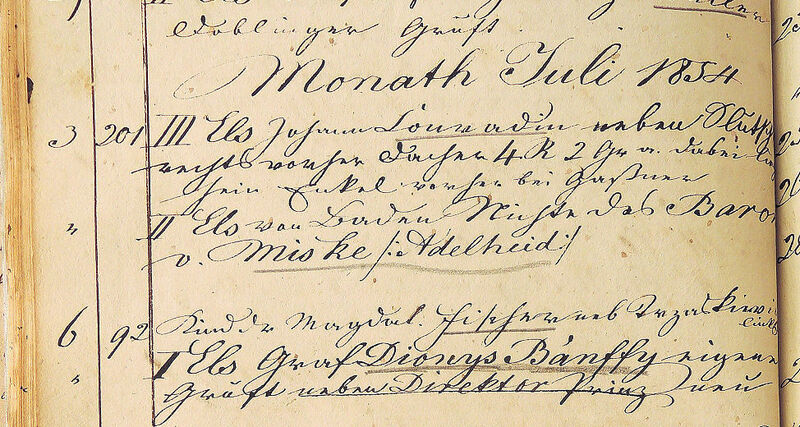 Second, based on a right of lien on real estate in Transylvania that had belonged to her uncle Ladislaus von Teleki, Minona drew a second pension of 420 gulden per annum. This annuity, which had to be paid by Minona's cousin Max von Teleki, had been bequeathed by Ladislaus von Teleki in his will of 22 June 1872. 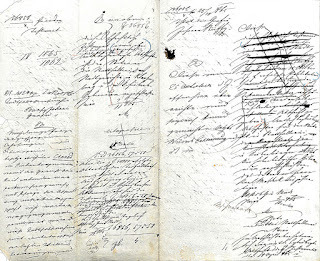 The cover sheet of Minona von Stackelberg's probate file (A-Wsa, BG Innere Stadt [I], A4, A 99/97). 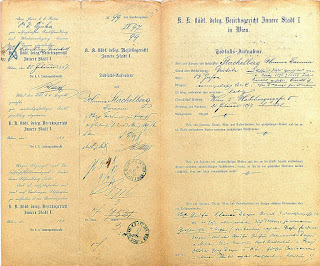 The note concerning Minona's 1896 guardianship is at the upper right. Minona left no will. The value of Minona von Stackelberg's estate, which consisted of old furniture and clothing, was estimated at 1,550 gulden 30 neukreuzer. Because these assets were exceeded by the liabilities (consisting of medical expenses, arrears of rent, burial costs, and a loan from Blanca Deym), Minona's estate was settled with a loss of 311 fl 59 x that was covered by Blanca Deym. On 23 February 1897 Minona von Stackelberg was put to rest in the Bánffy crypt in the Zentralfriedhof. Her burial cost 373 fl 80 x. The dates given in the following protocol are dubious: "20./VII." for the reburial of the Bánffy couple is at odds with the information in the digital database, and "18./II. 97" for Minona's burial cannot be correct. The crypt of the Bánffy de Losoncz couple and their companion Minona von Stackelberg in group 48A of the Zentralfriedhof still exists. The headstone is gone and all that remains of the crypt is its lid on the ground. The eerily anonymous state of this burial site seems to indicate that "Anonim" (the ananym of Minona's name) had to become reality at some point of time. The crypt left of the Bánffy/Stackelberg site belongs to the von Gapp family and is still in use (its status is "auf Friedhofsdauer"). The last person buried there was Peter Anton (von) Gapp in 2010. Although the crypt's right of usage expired in 1986 (the last fee seems to have been paid in 1926), it is not in immediate danger of being vacated. It is located in a loosely occupied area of the cemetery where there will never be a shortage of space. It should be an easy task to open this crypt, identify Minona's remains (they must be resting on top of the Bánffy couple's metal coffins), and take bone samples to conduct a DNA analysis. Owing to the characteristics of paternal mitochondrial DNA (which does not reach the offspring's genome), the chances of identifying Minona's father, however, are basically nil. Apart from the doubtful scientific meaningfulness of such an enterprise, if this research were performed with the appropriate seriousness and would result in a high-quality TV documentary, a huge financial profit is waiting to be made here. But if, as is to be expected, the results do not prove that Beethoven was Minona von Stackelberg's father – what then? Caeyers, Jan. 2012. Beethoven Der einsame Revolutionär Eine Biographie. Munich: C.H. Beck. Du Montet, Alexandrine Prévost de la Boutetière de Saint-Mars. 1904. Souvenirs de la baronne du Montet 1785-1866. Paris: Plon-Nourrit et Cie.
Goldschmidt, Harry. 1977. Um die Unsterbliche Geliebte. Eine Bestandsaufnahme. Leipzig: Deutscher Verlag für Musik. Hampeis, E. M. 1833. Chronologische Epigraphik der Friedhöfe Wien’s. Erster Band. Vienna: Carl Gerold. Kaznelson, Siegmund. 1954. Beethovens Ferne und Unsterbliche Geliebte. Zürich: Standard. Klapproth, John E. 2011. Beethoven’s Only Beloved: Josephine!. 1st ed., Charleston, SC: CreateSpace. La Mara (ed.). 1900. Franz Liszt's Briefe an die Fürstin Carolyne Sayn-Wittgenstein. Leipzig: Breitkopf & Härtel. ––––––. 1909. Beethovens Unsterbliche Geliebte. Das Geheimnis der Gräfin Brunsvik und ihre Memoiren. Leipzig: Breitkopf & Härtel. ––––––. 1920. Beethoven und die Brunsviks. Nach Familienpapieren aus Therese Brunsviks Nachlaß. Leipzig: C.F.W. Siegel's Musikalienhandlung. Lorenz, Michael. 2001. "»Baronin Droßdik und die verschneyten Nachtigallen«. Biographische Anmerkungen zu einem Schubert-Dokument". Schubert durch die Brille 26. Tutzing: Schneider, 47-88. ––––––. 2011. "'Die enttarnte Elise'. 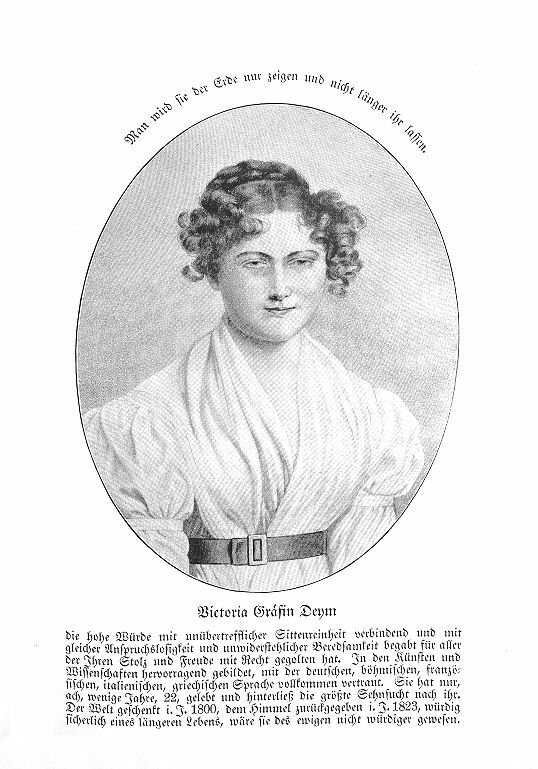 Die kurze Karriere der Elisabeth Röckel als Beethovens 'Elise'". Bonner Beethoven-Studien, Vol. 9. Bonn: Beethoven-Haus, 169-90. ––––––. 2013. "Maria Eva Hummel. A Postscript". Vienna: Internet publication. Markus, Georg. 2017. Fundstücke Meine Entdeckungsreisen in die Geschichte. Vienna: Amalthea. Pemmer, Hans. 1970. 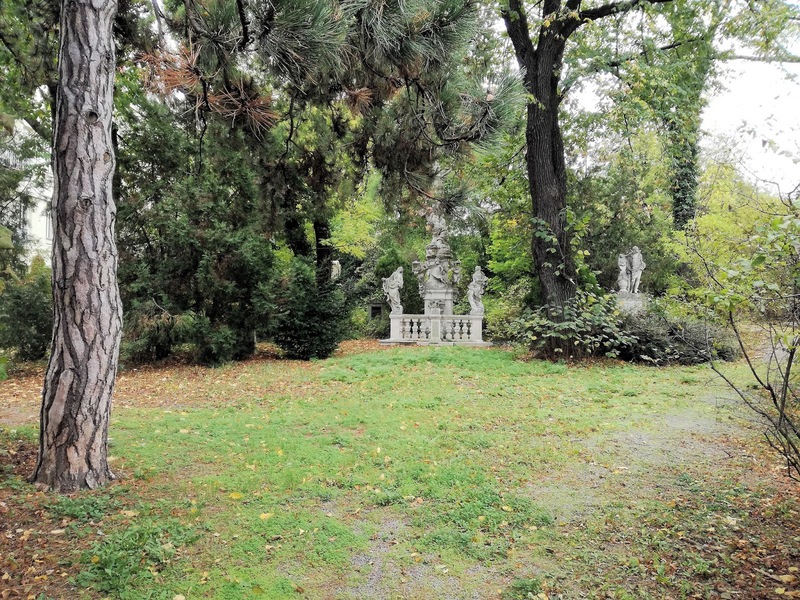 "Der Gräberhain im Schubertpark und der ehemalige Währinger Ortsfriedhof". In: Bezirksmuseum Währing. Unser Währing 5, vol. 1, 2-10. Pichler, Ernst. 1994. Beethoven Mythos und Wirklichkeit. Vienna: Amalthea. Pocknell, Pauline (ed.). 2000. Franz Liszt and Agnes Street-Klindworth A Correspondence, 1854-1886. Franz Liszt Studies Series No. 8. Hillsdale NY: Pendragon Press. Short, Michael (ed.). 2003. Liszt Letters in the Library of Congress. Franz Liszt Studies Series No. 10. Hillsdale NY: Pendragon Press. Steblin, Rita. 2002. "Josephine Gräfin Brunswick-Deyms Geheimnis enthüllt Neue Ergebnisse zu ihrer Beziehung zu Beethoven". In: Österreichische Musikzeitschrift, 6/2002, 23-31. ––––––. 2009. "'A dear, enchanting girl who loves me and whom I love' New Facts about Beethoven’s Beloved Piano Pupil Julie Guicciardi". In: Bonner Beethoven-Studien 8, 89-152. Tellenbach, Marie-Elisabeth. 1983. Beethoven und seine “Unsterbliche Geliebte” Josephine Brunswick. Ihr Schicksal und der Einfluß auf Beethovens Werk. Zürich: Atlantis. © Dr. Michael Lorenz 2017. I express my gratitude to Anna Forster-Petrova, Lucia Schuger, David Buch, Catherine Sprague, Giuseppe Mariotti, Stefano Frega, Anne-Louise Luccarini, Wolfgang Oehmicke, Noemí Cabello, Janet Page, and Luk Vaes for their support during my research for this article. Awesome research, as always. Thank you so much for sharing it. If someone open that tomb and do the DNA analysis, I hope it will not turn out to be a circus like it was in the case of Mozart's skull. Hopefully, if done, be serious, and that could really end one of the great legends around Beethoven. But are the remnants of Minona really there? They should be ... but ... A warm greeting. Thanks for this very interesting research. It was a pleasure reading it. Question: Did Beethoven knew about Minona ? Born in 1813 and Beethoven & Josephine having spend time together in Baden in 1816... it would be very likeley that they had talked about the matter. Question: Did Minona knew about Beethoven ? There are authors who claim that Beethoven knew about Minona. Regarding Minona's knowledge about Beethoven being her father everything is purely hypothetical.